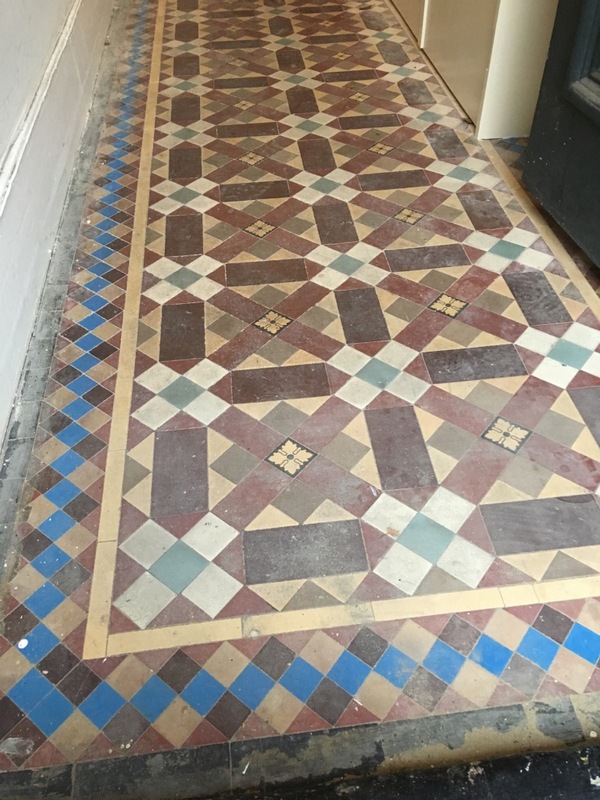 My customer was renovating their house in Gloucester and discovered this lovely vibrant Victorian tiled floor with blue accents under the carpet and were keen to get it restored and back to its’ former self. 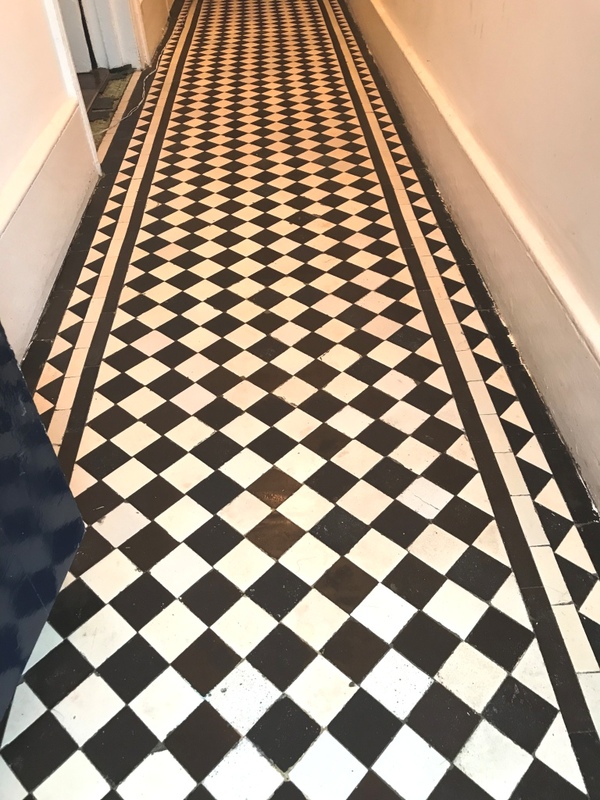 Gloucester lies close to the Welsh border, on the River Severn, between the Cotswolds to the east and the Forest of Dean to the southwest. 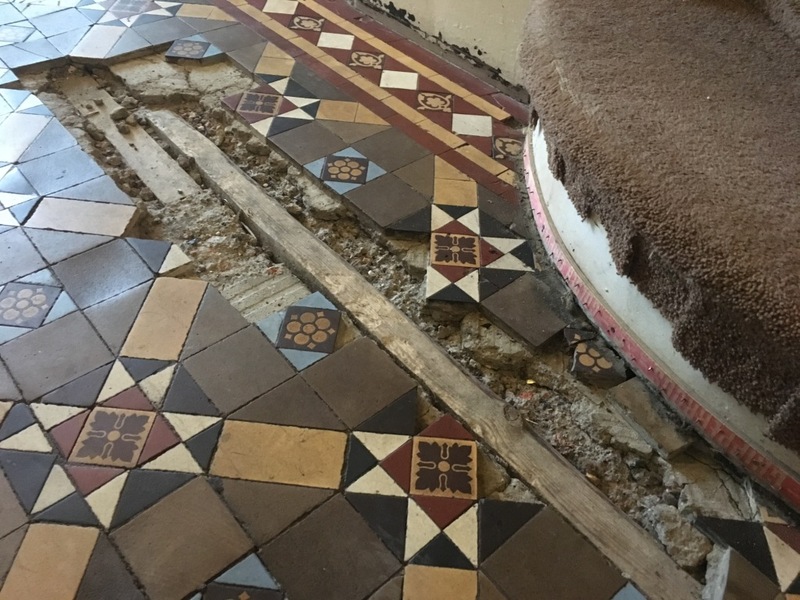 They were delighted to uncover the original floor but unsure if it could be restored asked me to come over and take a look. 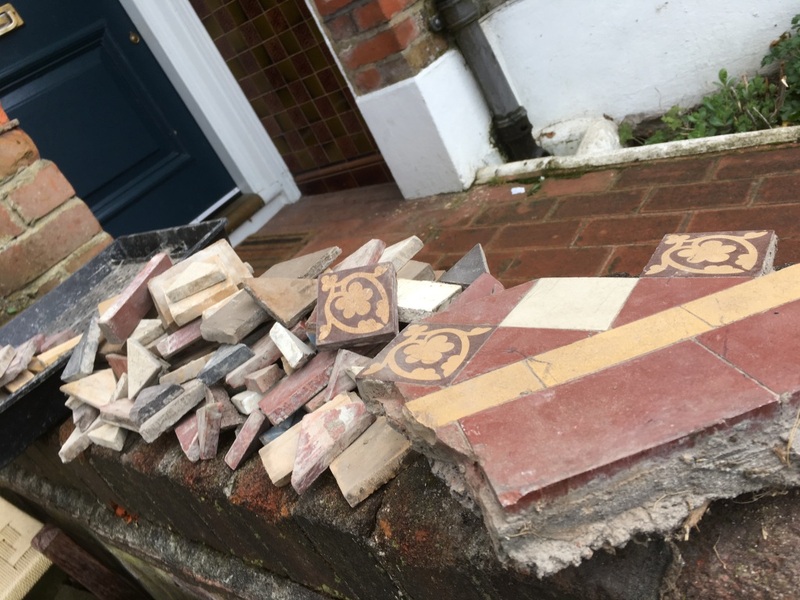 The tiles were in good physical condition for their age but were ingrained with dirt and had paint splashes, cement and carpet glue on the surface. 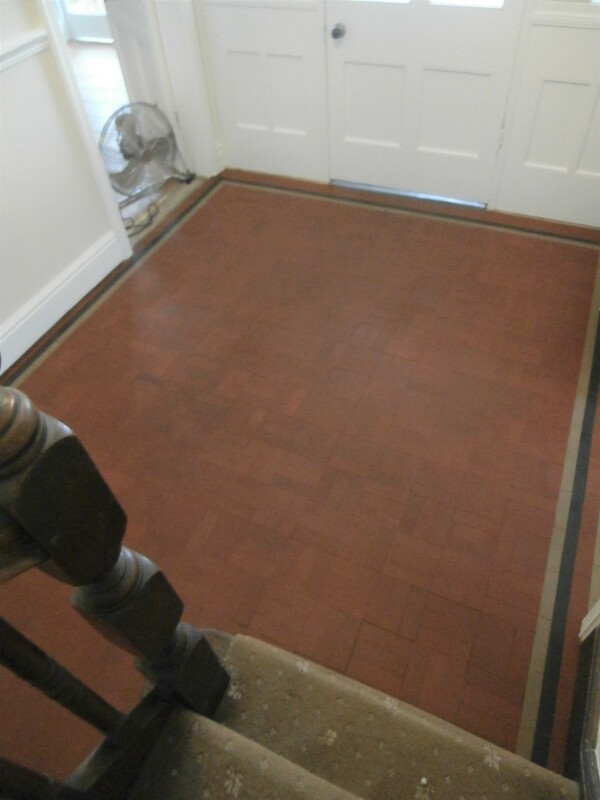 The property had lots of period features, but this was by far the nicest. 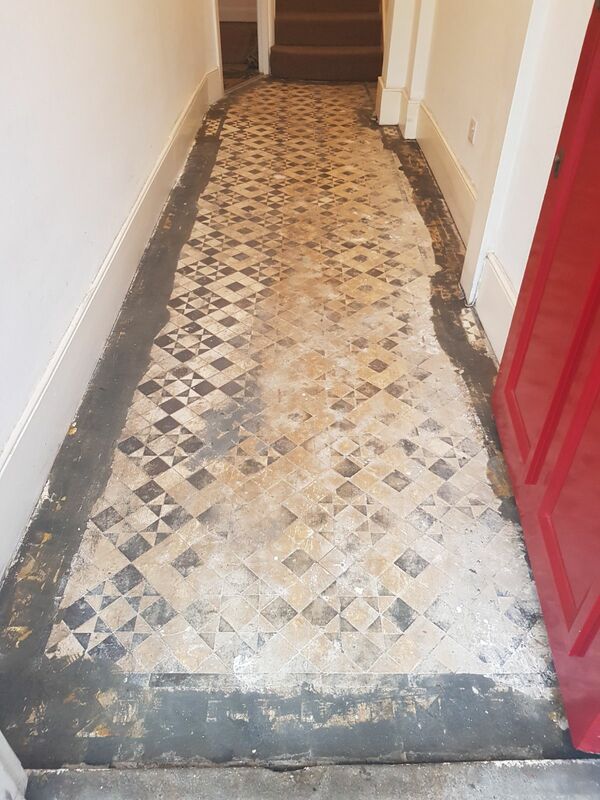 Luckily there was very little damage to the floor, so there was no need to source any extra tiles. 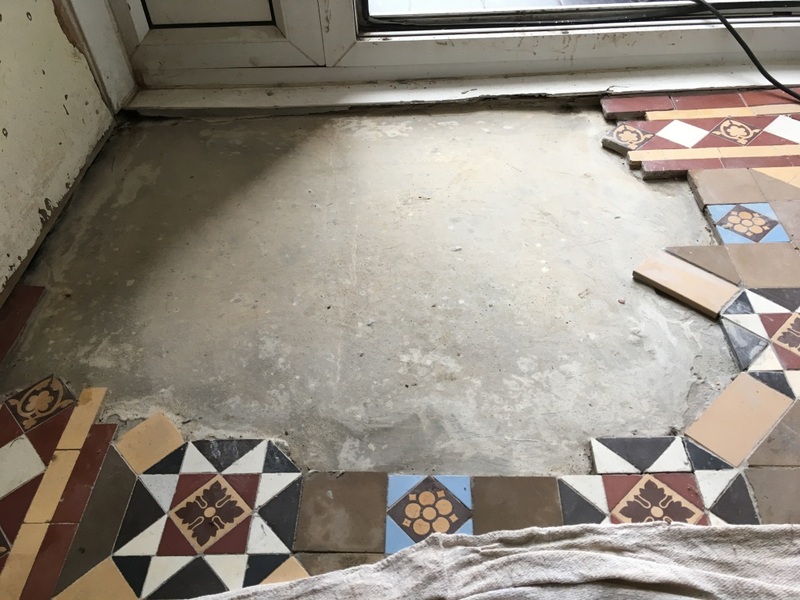 We discussed what needed to be done and how the process would work, agreed a price and a timescale for the project which was accepted. 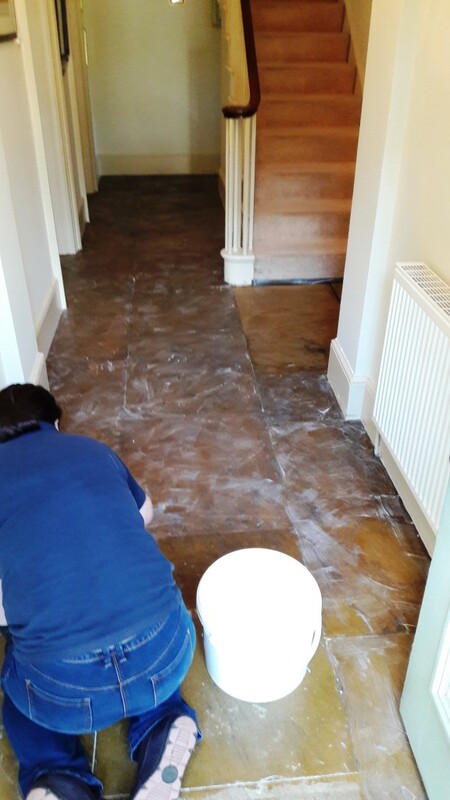 The first process was to cover walls and skirting boards with plastic sheeting, I usually do this as a rule but in this case the hallway had just been decorated so we wanted to avoid any dirty splashes from the cleaning process. 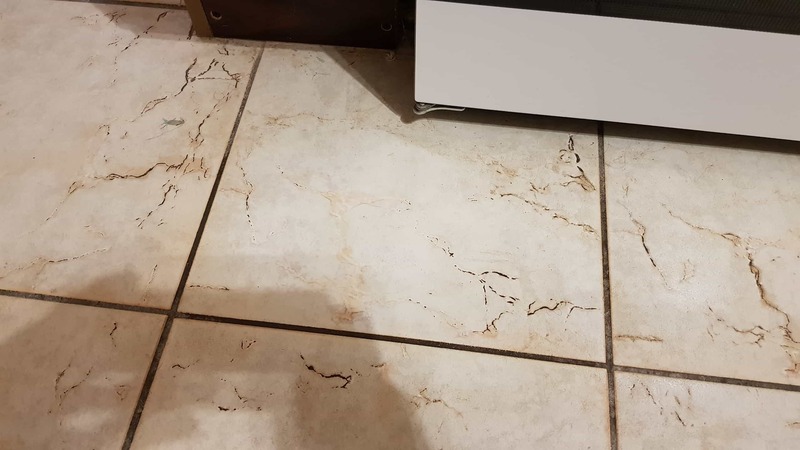 Next a solution of tile doctor Tile Doctor Remove and Go was applied to the floor and left to dwell for 20 minutes and then with a buffing machine and black scrubbing pad I set about deep cleaning the floor. 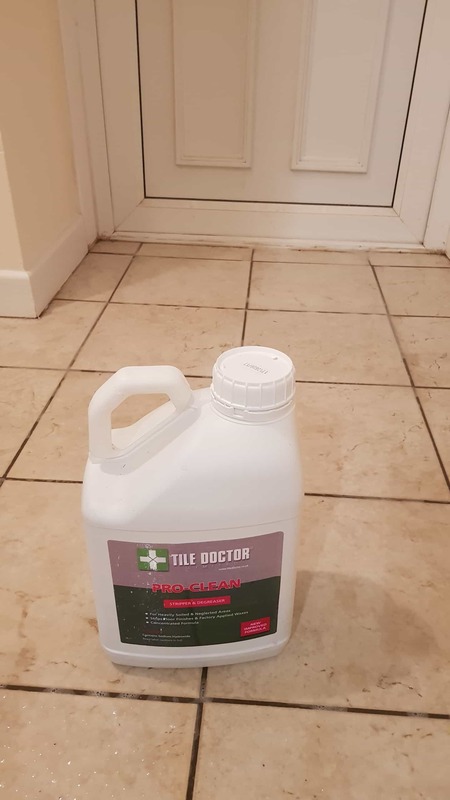 Tile Doctor Remove and Go is a strong coatings remover that can deal with old sealers, paint and glue, it’s also safe to use on tile, grout and stone. 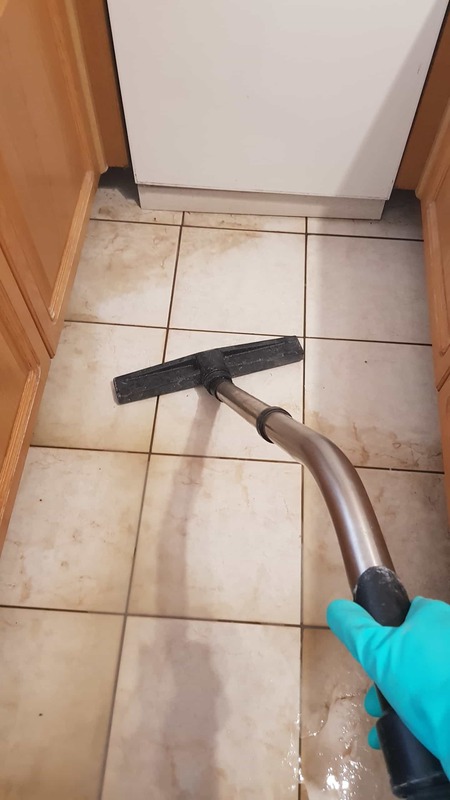 The floor was then rinsed with water and the now soiled cleaning solution was extracted from the floor with a wet vacuum. 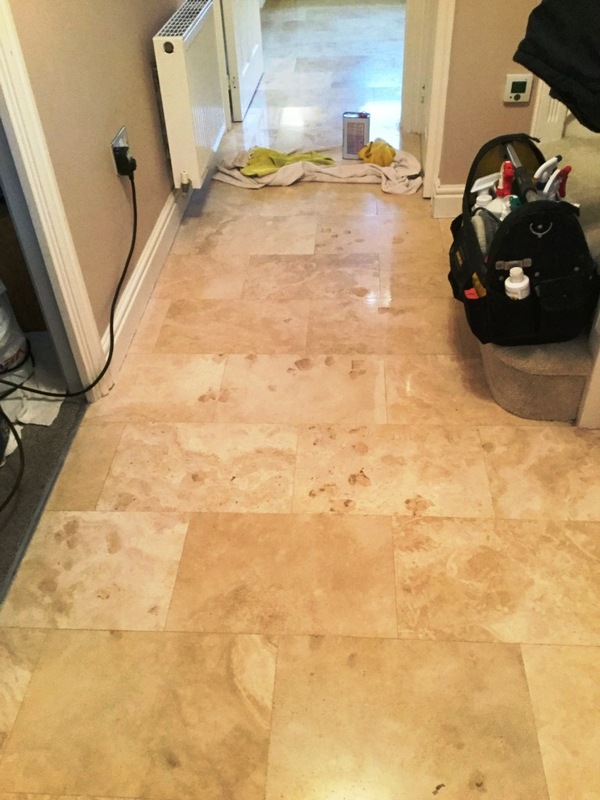 Stubborn stains were spot treated using the same process and once satisfied with the results I gave the floor an acid wash using Tile Doctor Acid Gel. 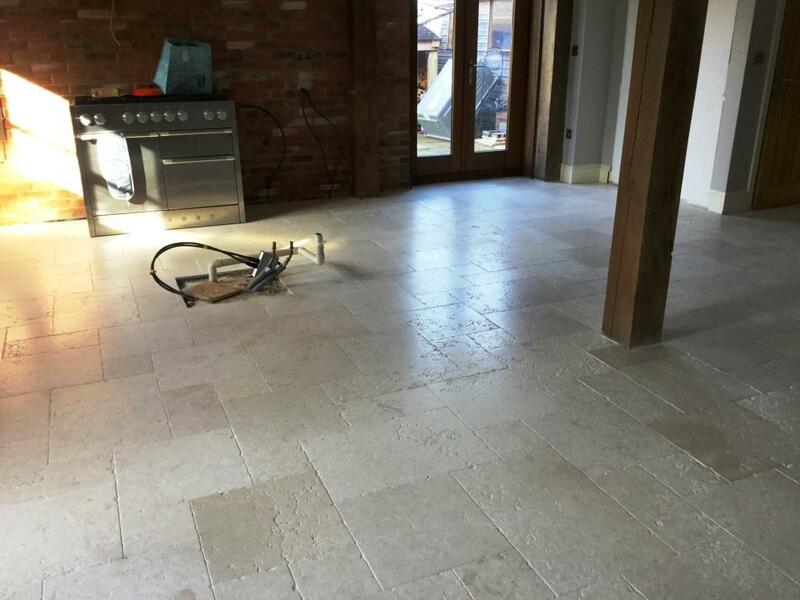 This neutralises any potential salt staining issues that could appear later as the floor dries. 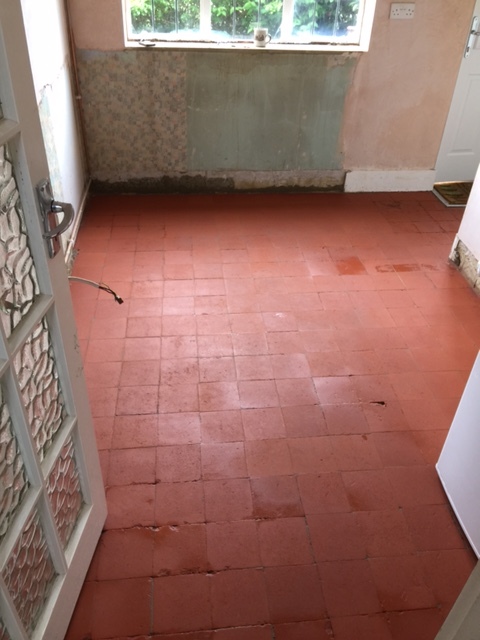 This process is known as efflorescence and can be very troublesome on old floors like these which don’t have a damp proof membrane installed. 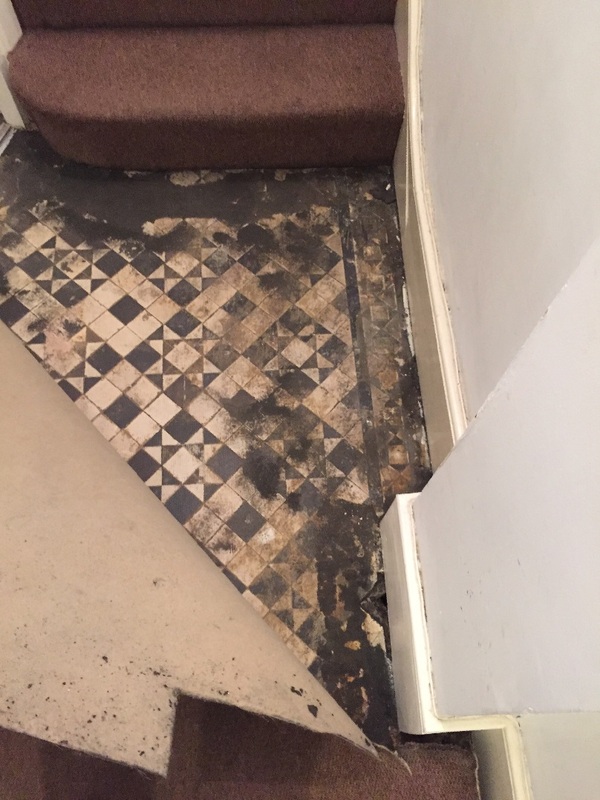 We often find covering old floors like these in a rubber underlay also prevents the floor from breathing which can lead to damp being trapped in the floor. 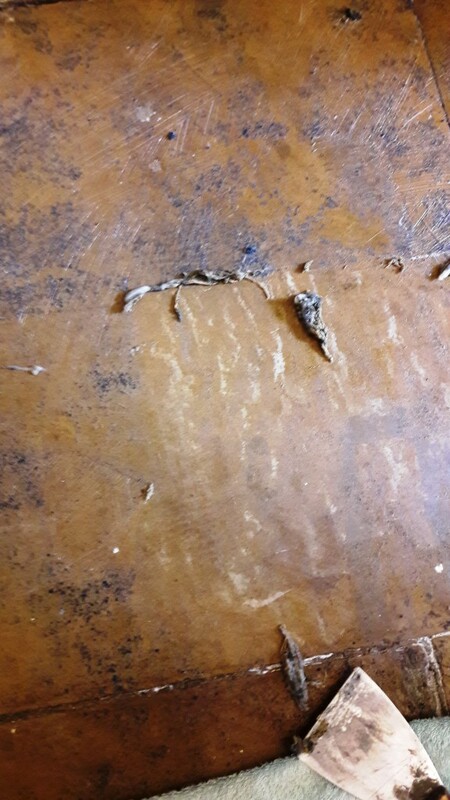 We left the floor to dry off overnight and then the next day checked for moisture. 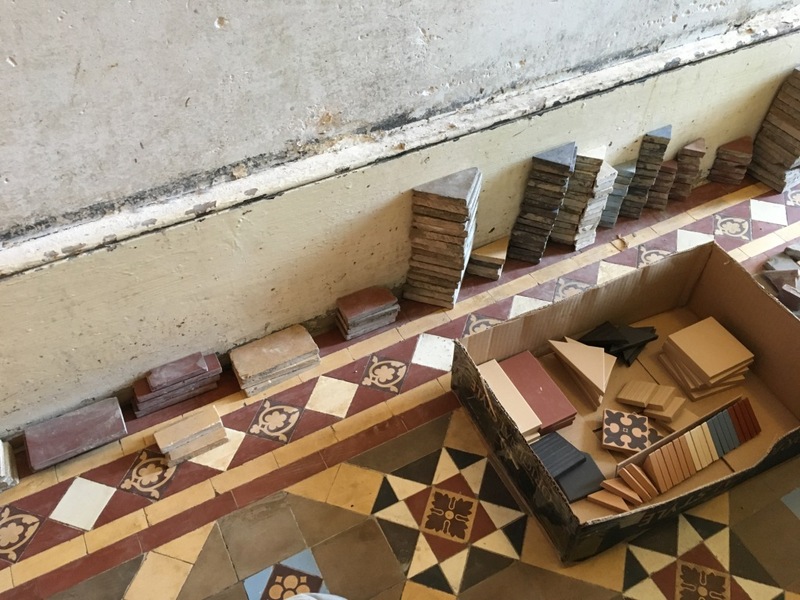 It’s been a long hot summer, so the tiles had soon dried out. 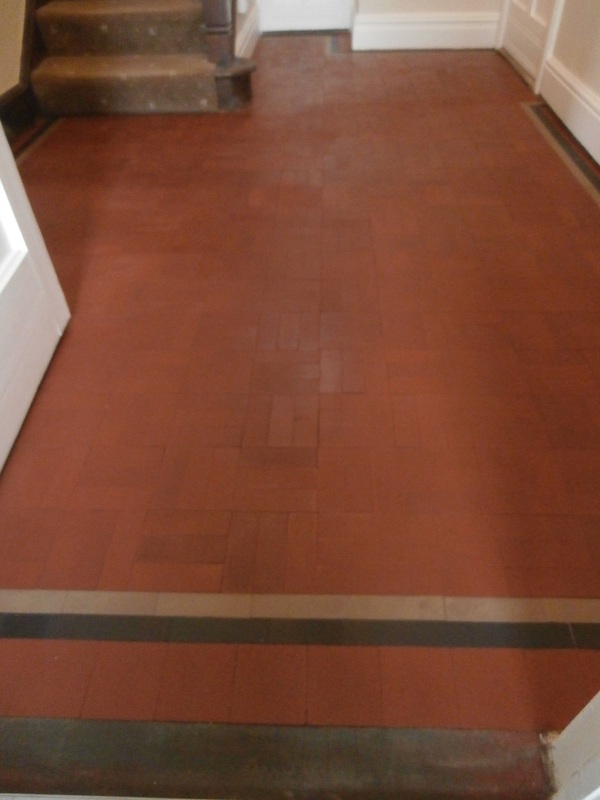 Happy with the results we started sealing the tiles with five coats of Tile Doctor Seal and Go. 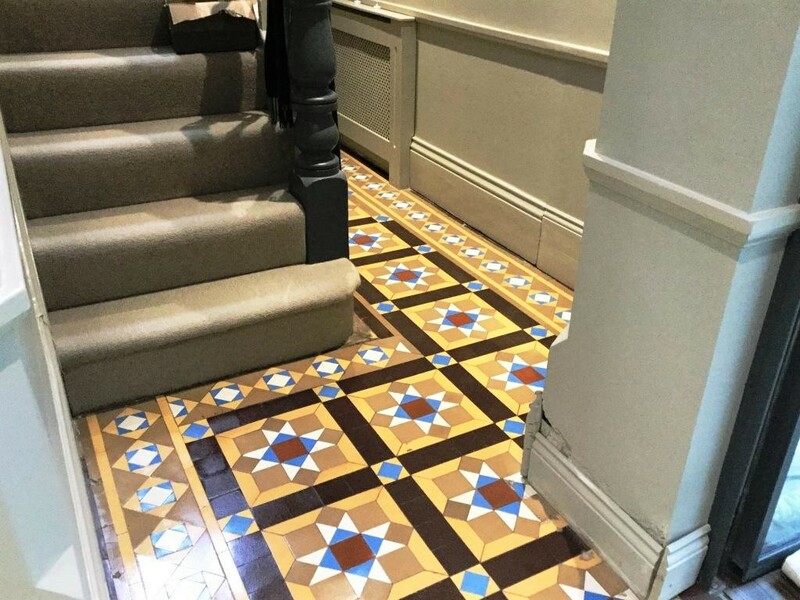 This is a specially formulated water-based blend of acrylic polymers that provides both a stain resistant surface seal and a durable low-sheen finish that works really well on Victorian tiled floors like this. 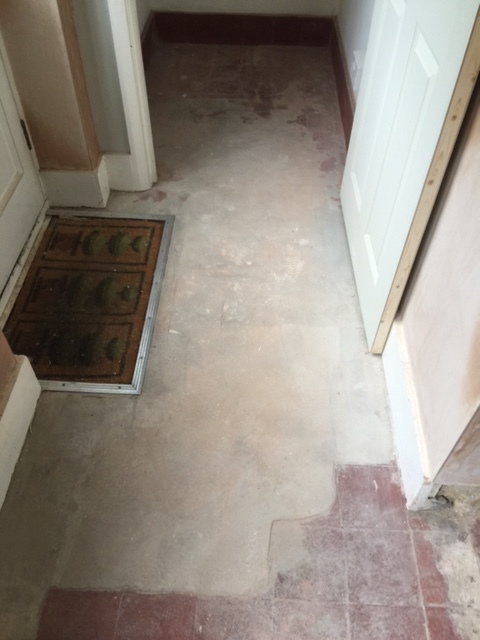 Additionally, the product allows moisture vapour transmission so will be able to cope with the fact that this floor has not damp-proof membrane. 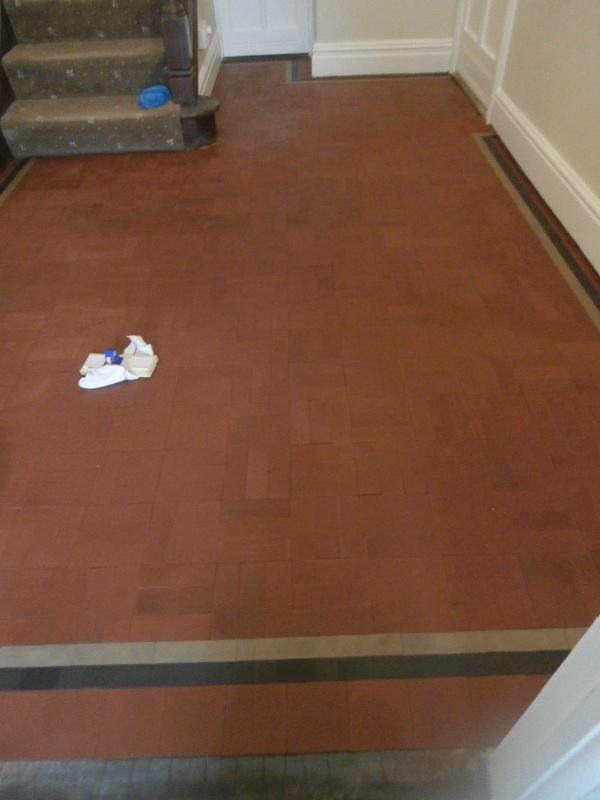 As you can see from the photos the sealant left a lovely finish and the customer was very pleased with outcome. 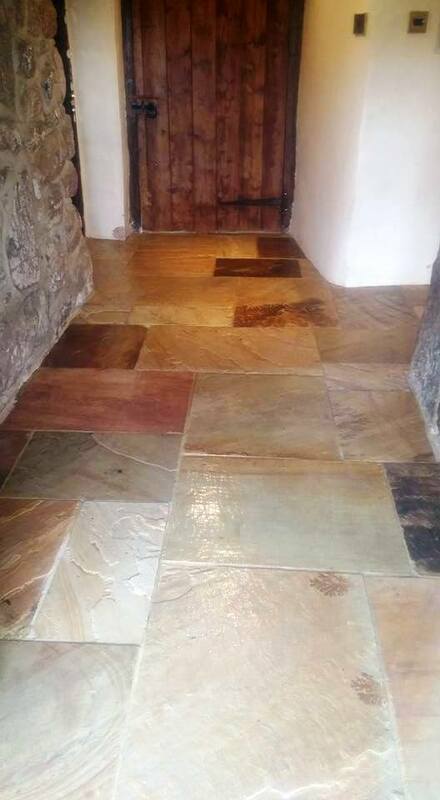 The floor is now restored and offers a lovely traditional entrance to their property. 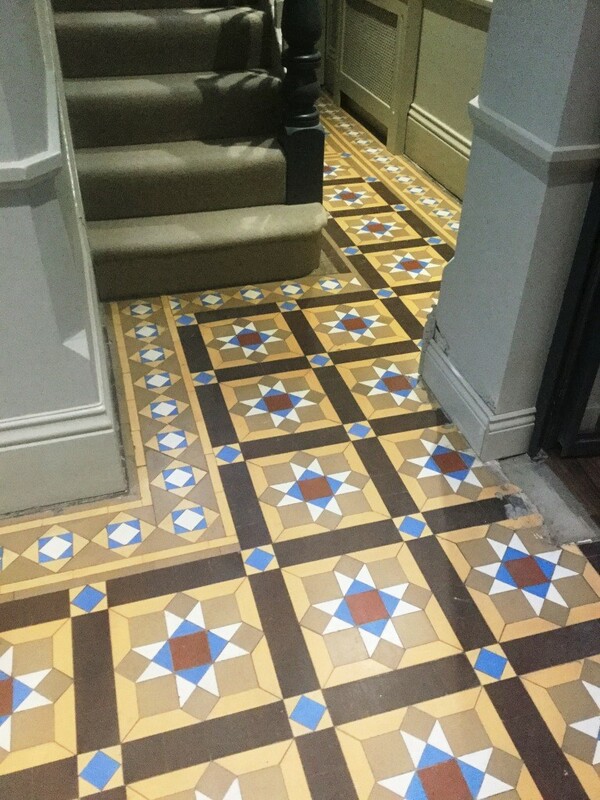 Bounds Green in North London has more than its fair share of Victorian terraced houses packed with desirable original features. 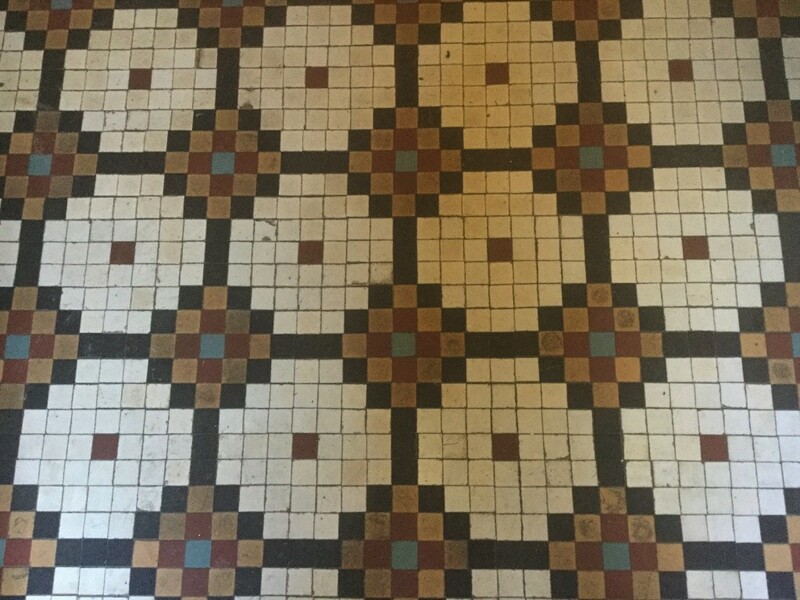 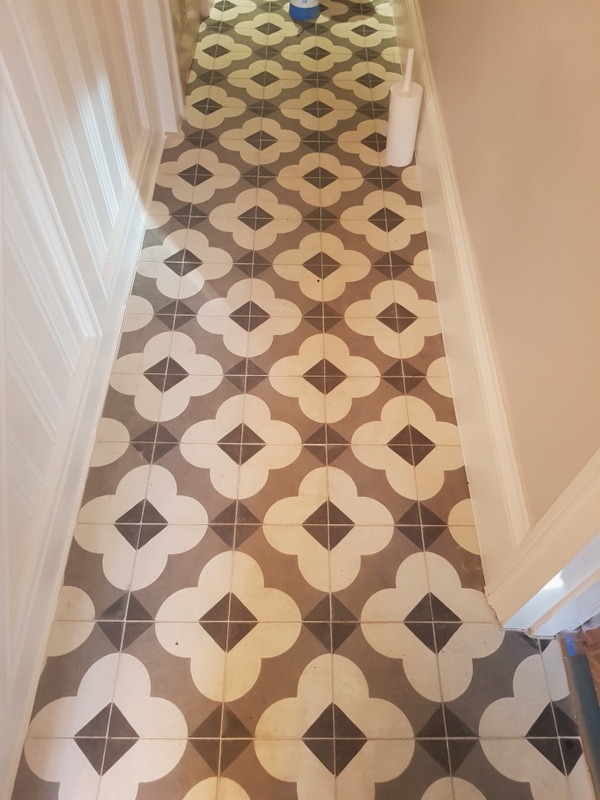 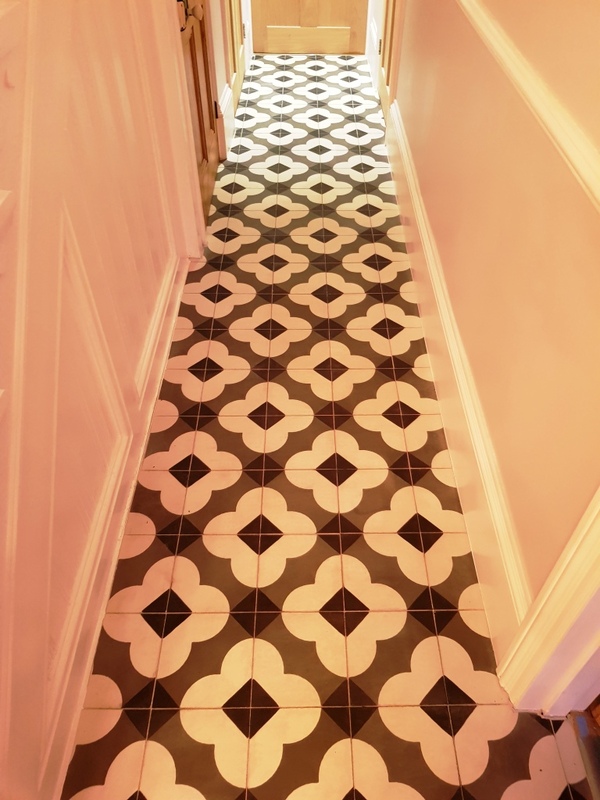 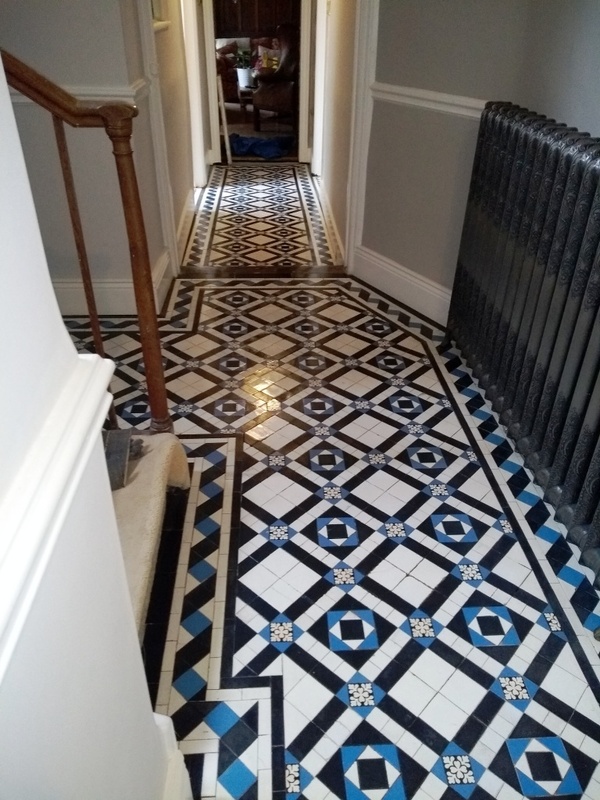 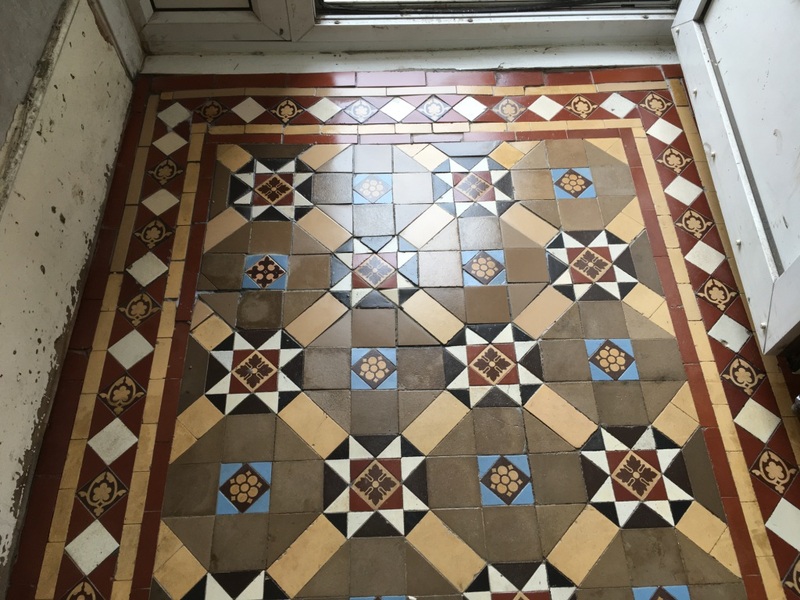 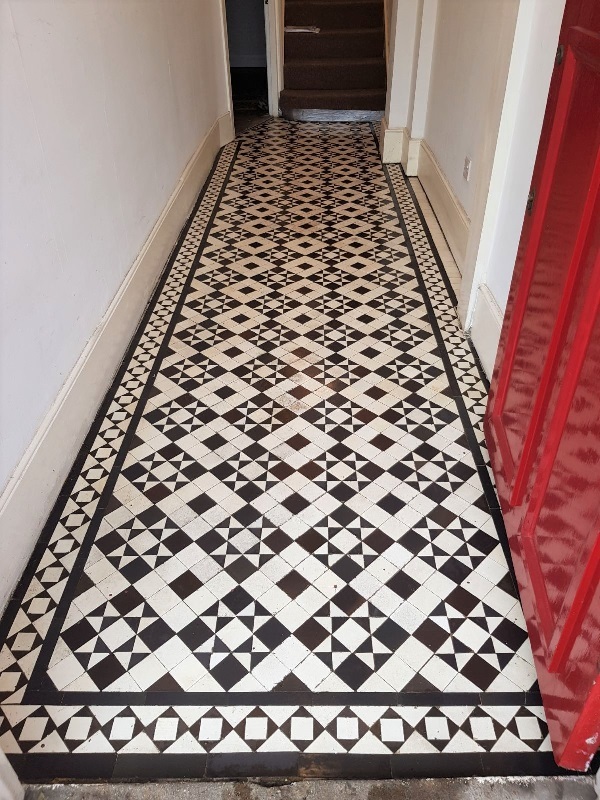 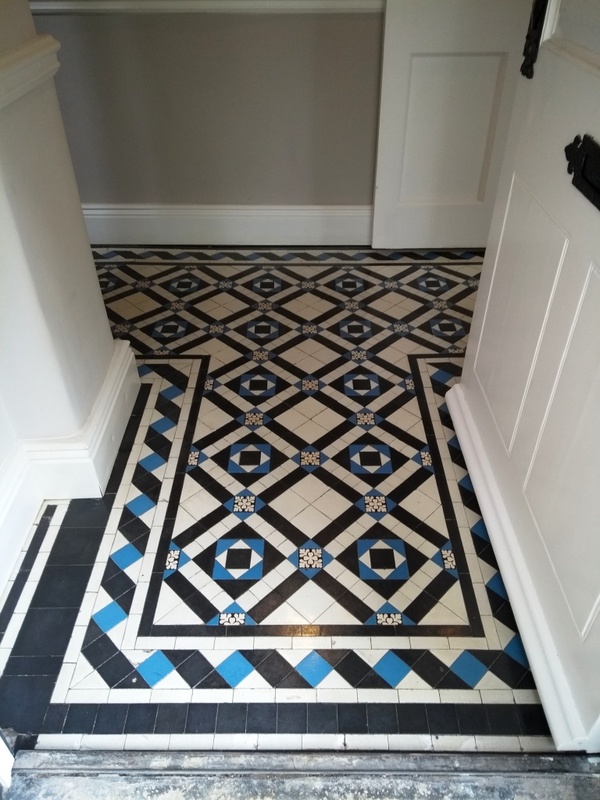 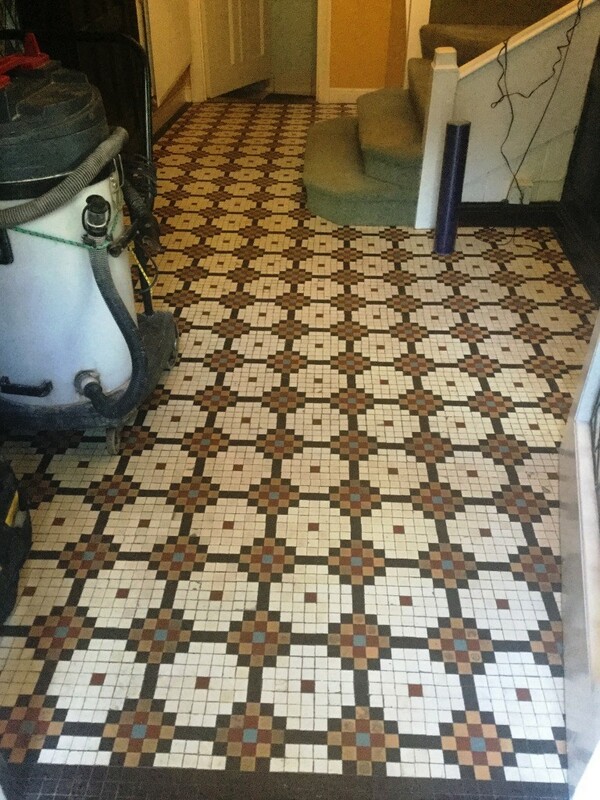 When the owners of this house pulled up their hallway carpet they were excited to discover a beautiful and original black and white Tessellated tiled floor. 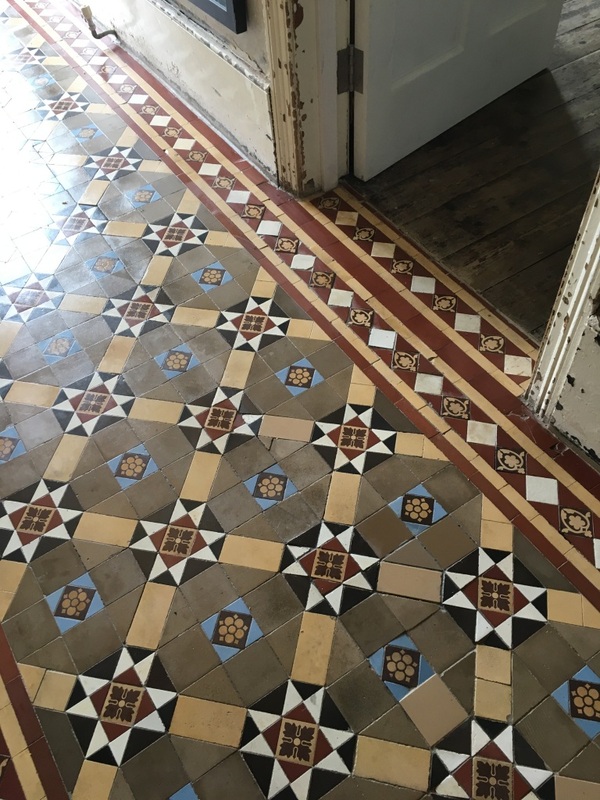 Tessellated tiled floors became fashionable from the 1860s and usually featured striking geometric patterns. 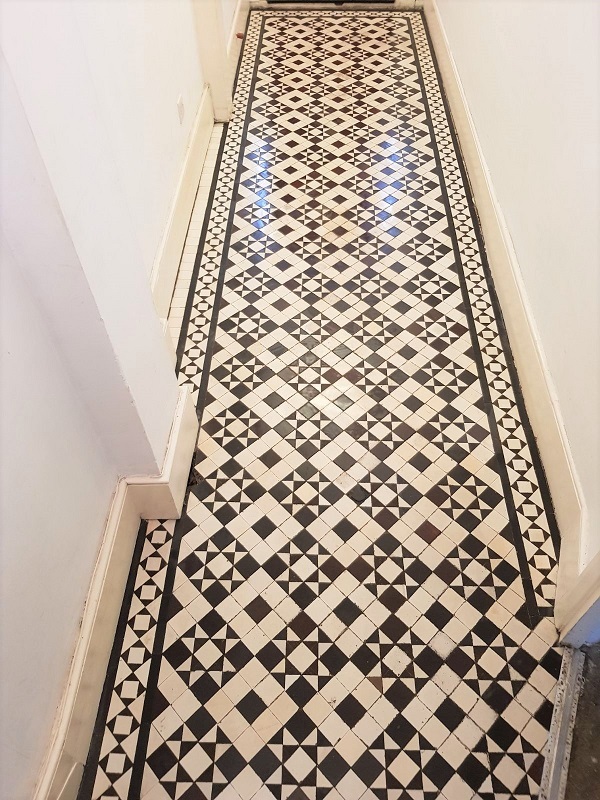 By the end of the century they had become an essential feature in the most ordinary Victorian terraced houses from Dover to Aberdeen. 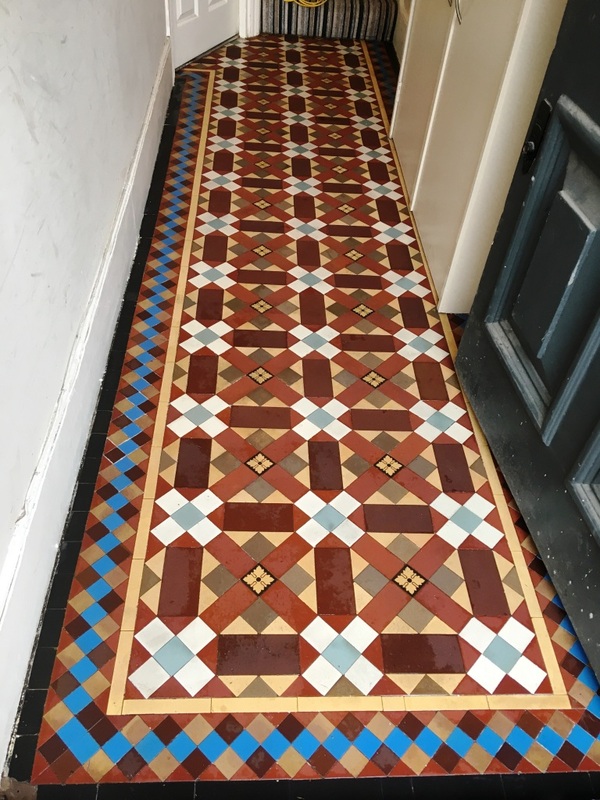 They fell out of fashion in the 1960s and 70s and were usually covered over with carpet or linoleum, but period house owners today understand their value and are restoring them back their former glory. 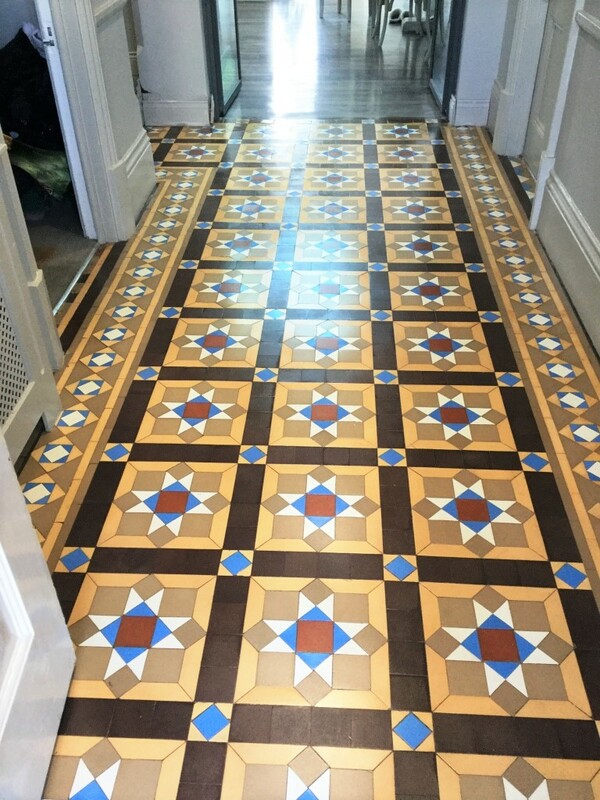 A well-restored tessellated tiled floor not only looks incredibly attractive but is durable and hard wearing. 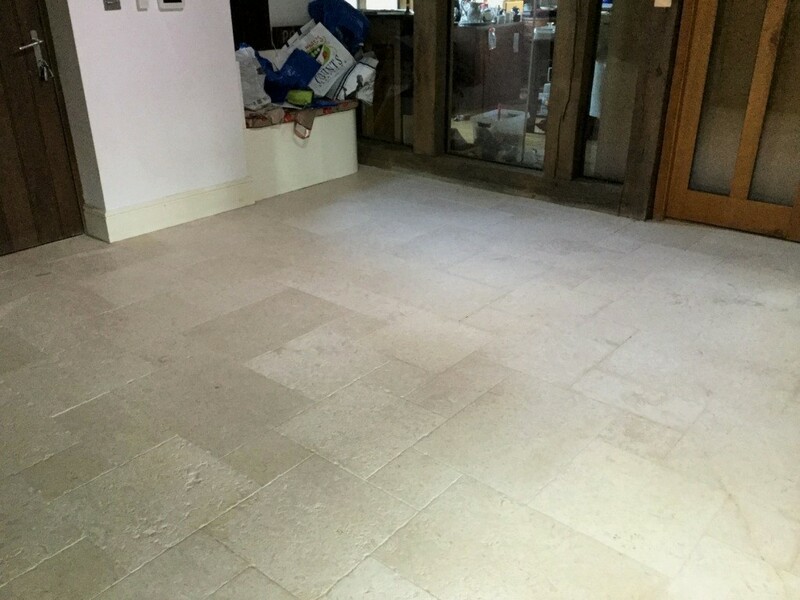 They were originally laid by highly skilled tillers and most have already survived 100 years of family wear and tear. 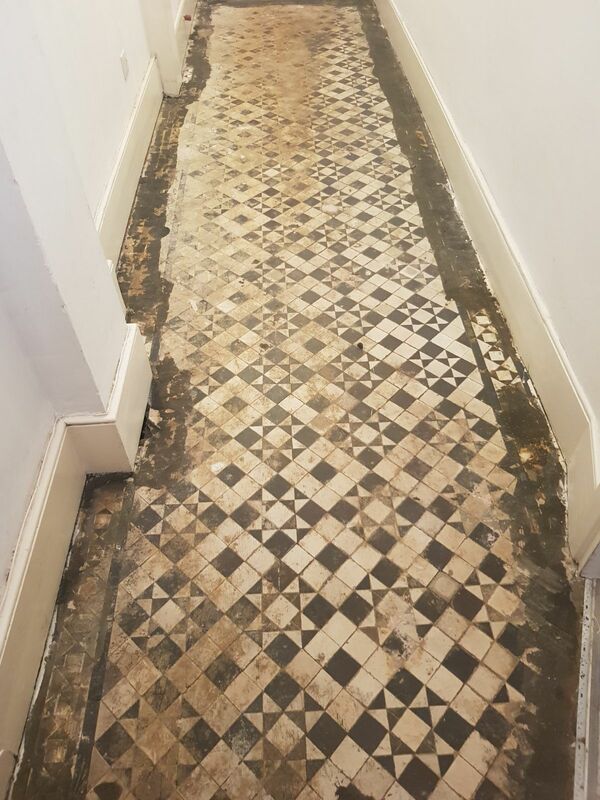 With the right care they will probably be good for another 100 years. 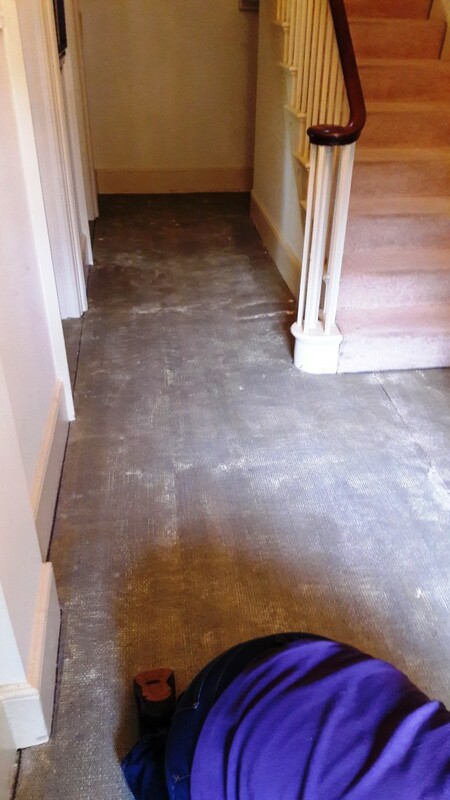 The first thing we did was cut away the rest of the carpet to expose the whole hallway. 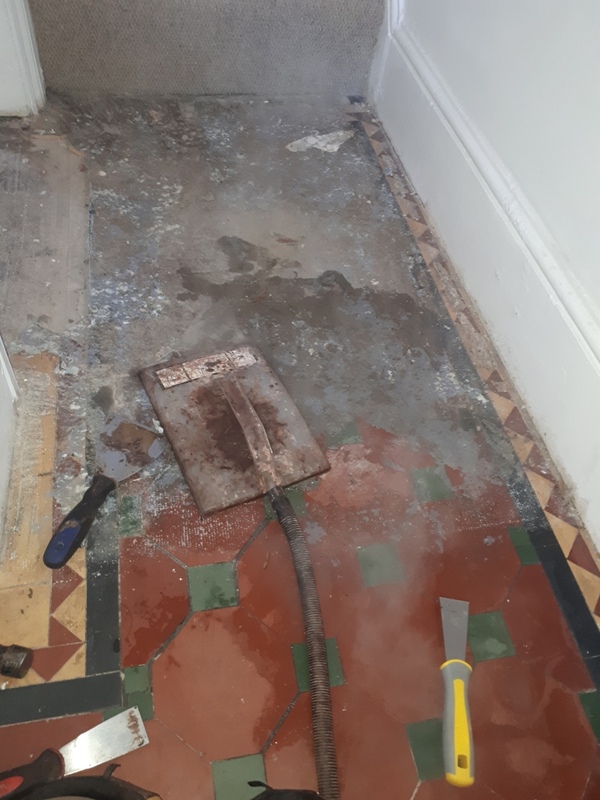 The floor looked in a relatively stable condition, but it was clear the floor needed a deep clean and some minor repairs. 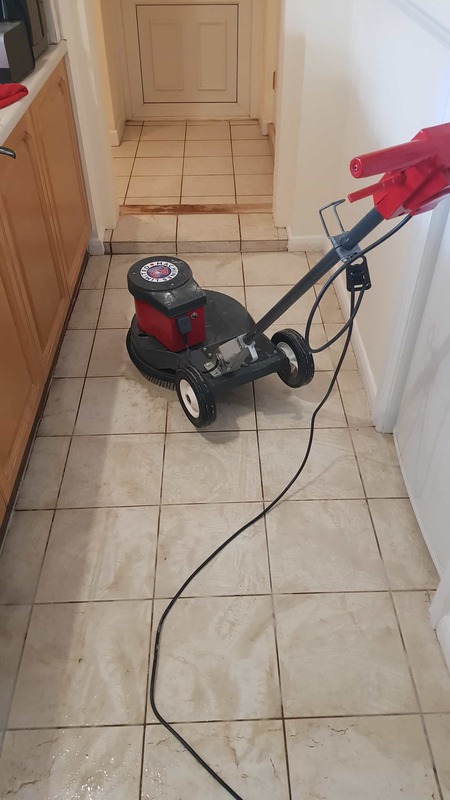 We started off by cleaning off each individual tile with Tile Doctor Remove and Go, a multi-purpose stripper that also draws out ingrained stains and removes old sealers and coatings; this took away all the glue and dirt from the carpet. 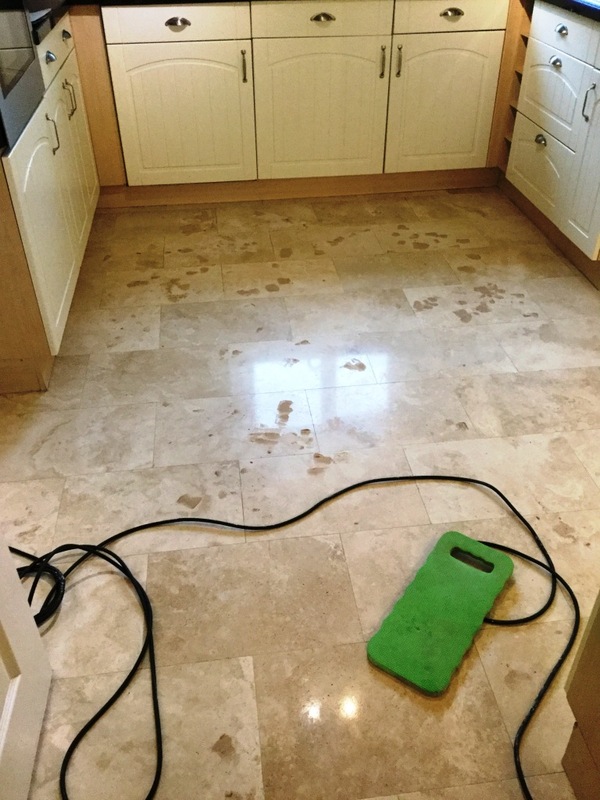 We then applied Tile Doctor Nanotech HBU which is specially designed to penetrate below tough stains, dissolve and lift them out. 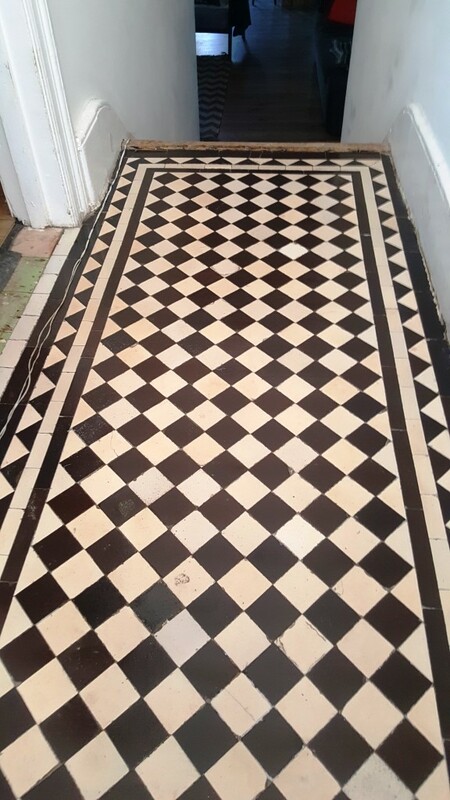 We left that for twenty minutes for maximum effect before lightly scrubbing. 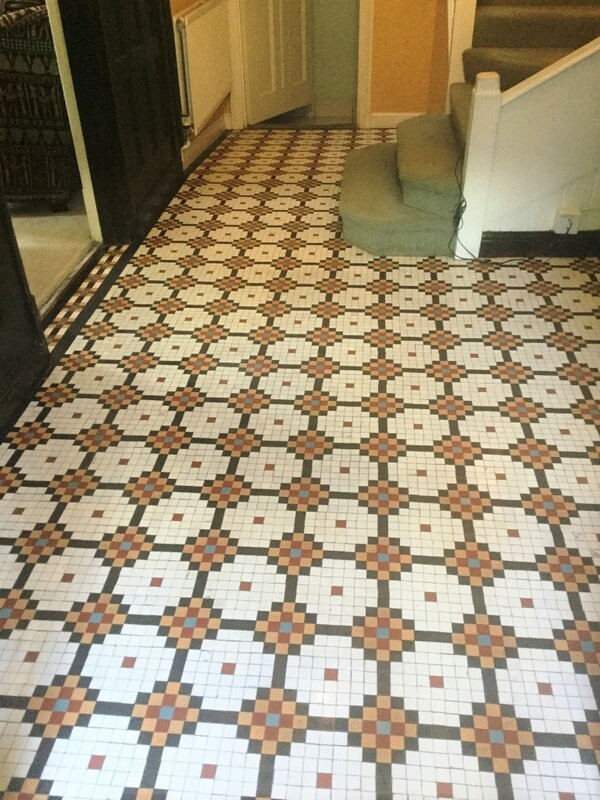 Each tile was then individually scrapped with polypropylene pads. 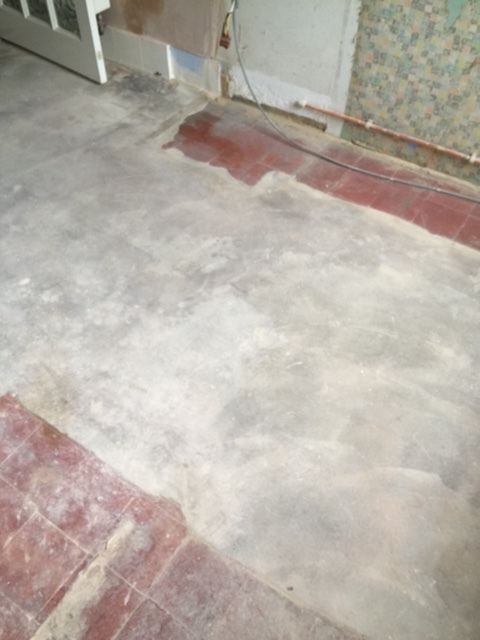 The next step was to remove the resultant soil by rinsing with water and extracting with a wet vacuum. 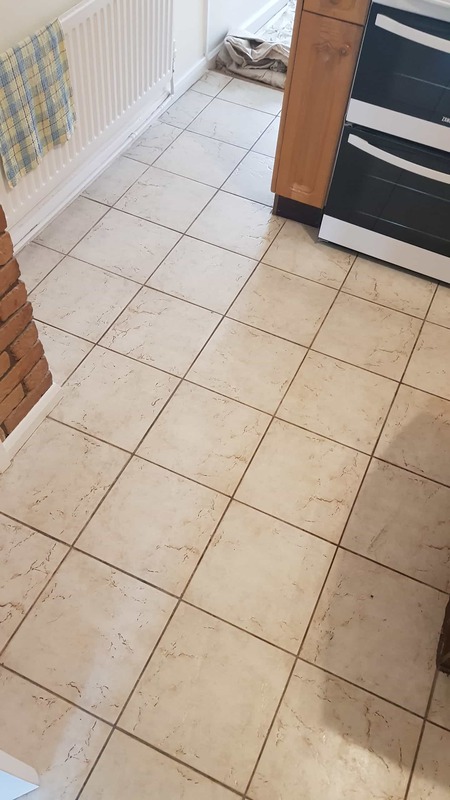 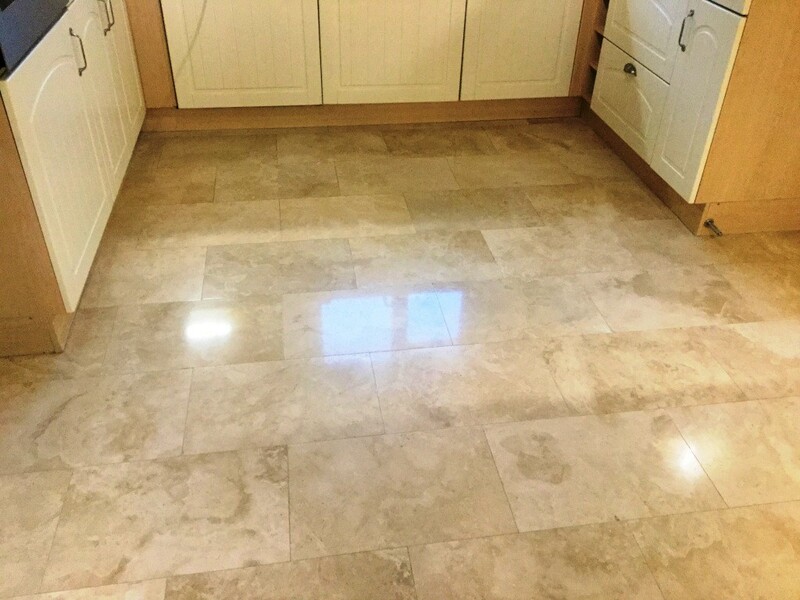 We steamed cleaned each tile and carried out a second clean with Tile Doctor Pro-Clean which is a strong cleaner and degreaser for heavily soiled and neglected tile, stone and grout that has been neglected or subjected to heavy use. 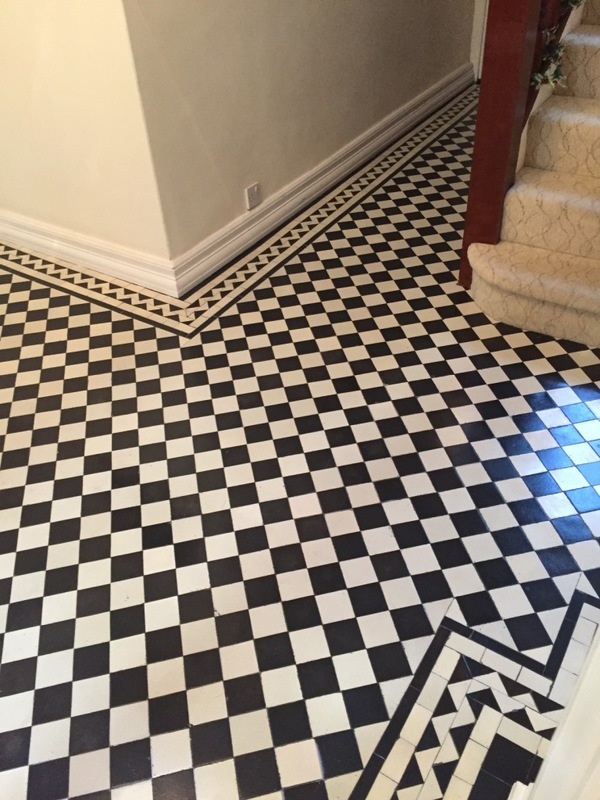 By now the floor was looking pretty good. 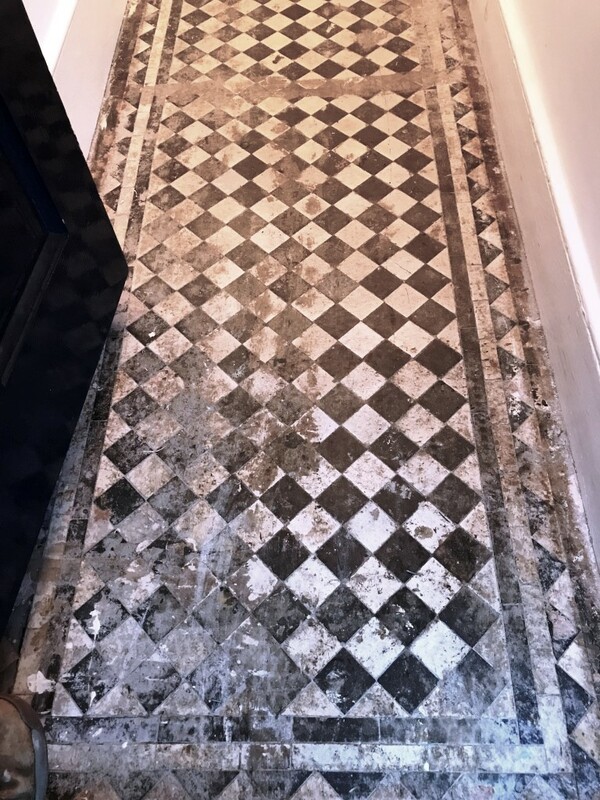 The beautiful black and white design of the floor was once again in evidence after decades of being hidden under carpet. 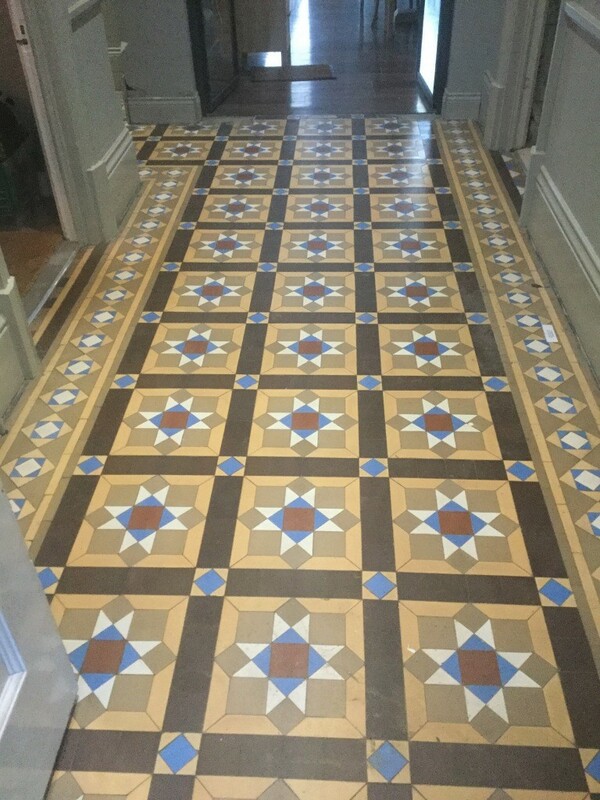 There were just a few more steps to complete the job and restore this floor to its original glory. 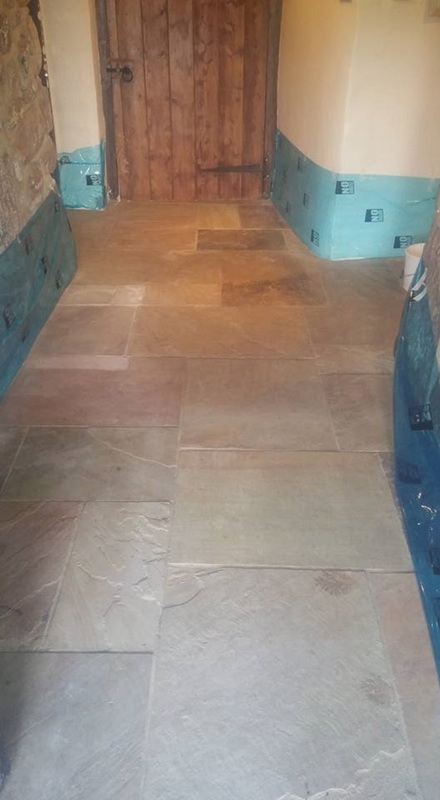 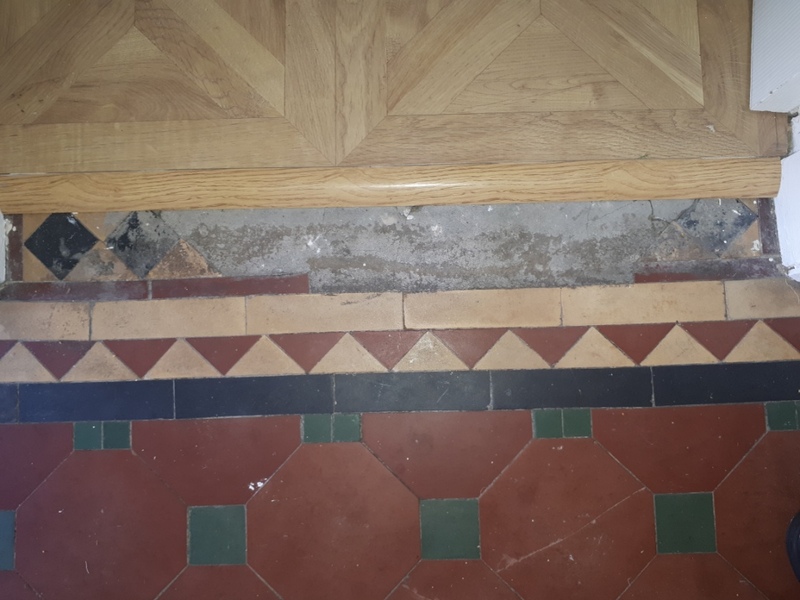 We carried out the minor repairs needed, carefully re-grouted the very fine gaps between the tiles and left the floor overnight for the grout to thoroughly dry. 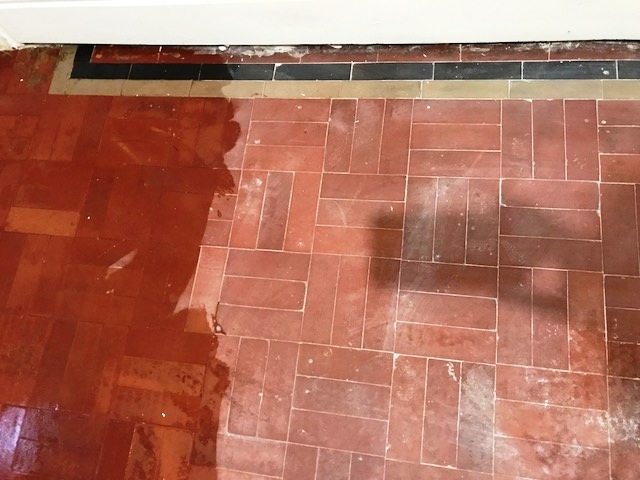 The next day we sealed the tiles with five coats of Tile Doctor Seal and Go to give a beautiful and natural low-sheen satin finish. 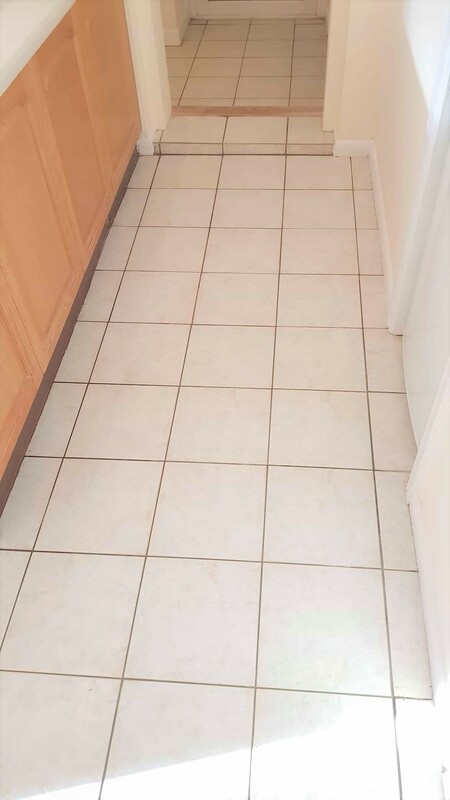 This specially formulated solution also provides a stain resistant surface seal and being water based it doesn’t leave a smell as it dries. 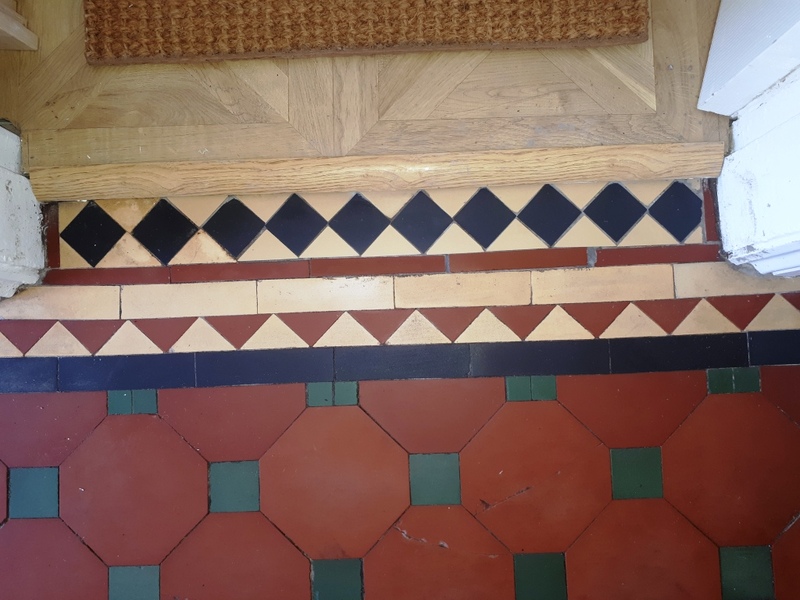 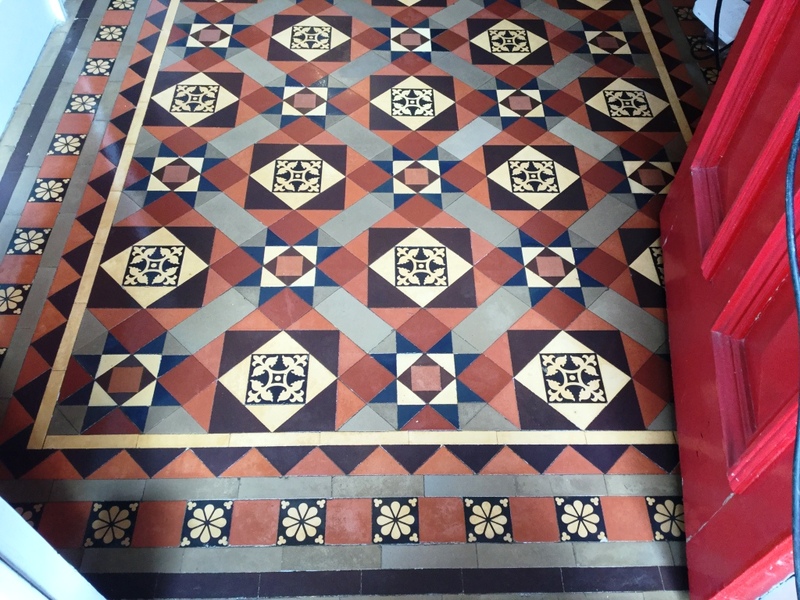 I was contacted by the owners of an old Farmhouse in the East Devon village of Broadclyst to look at their Victorian Tiled Hallway floor which as you can see from the photograph below was heavily stained and had also been splashed with paint from decorating. 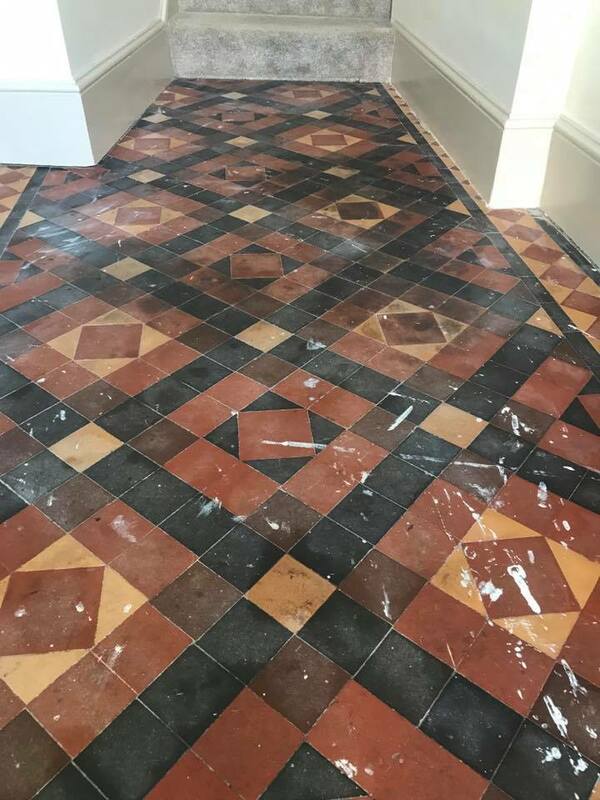 Victorian tiles are very robust and can take a lot of punishment which you certainly get in a farmhouse, however once the sealer wears off dirt gets into the pores of the tile making it very difficult to clean. 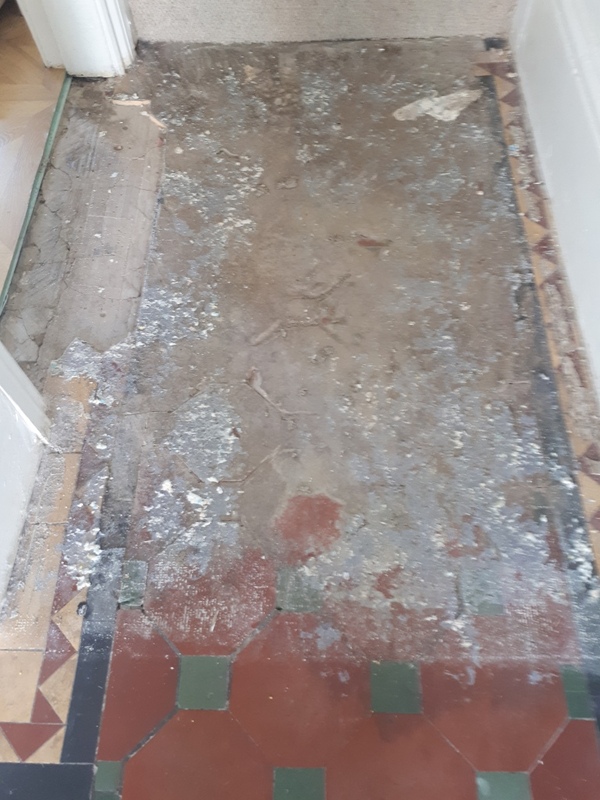 I visited the property to take a closer look and to take some moisture readings because these old floors don’t have a Damp Proof Course and moisture levels too high can restrict when this type of work can be done due to the sealers needing the floor to be dry in order to cure. 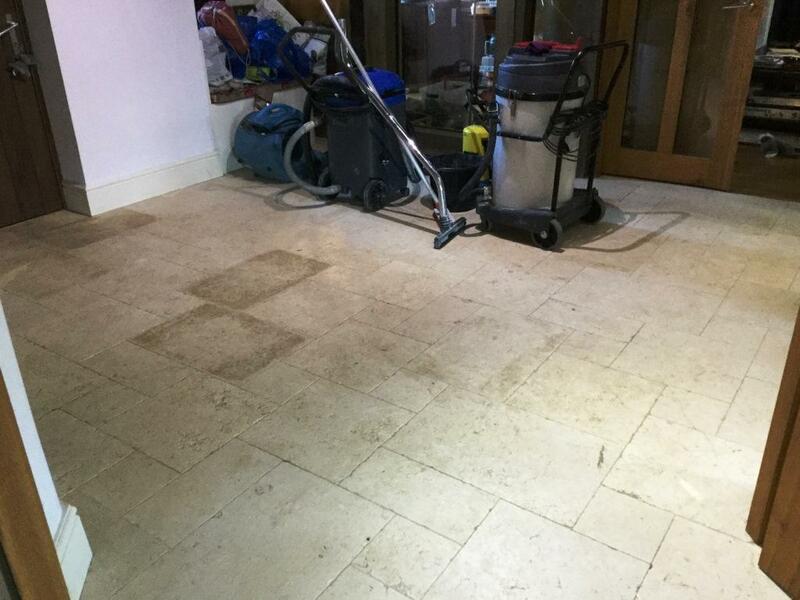 I also did a test piece to show the customers what level of cleaning could be achieved. 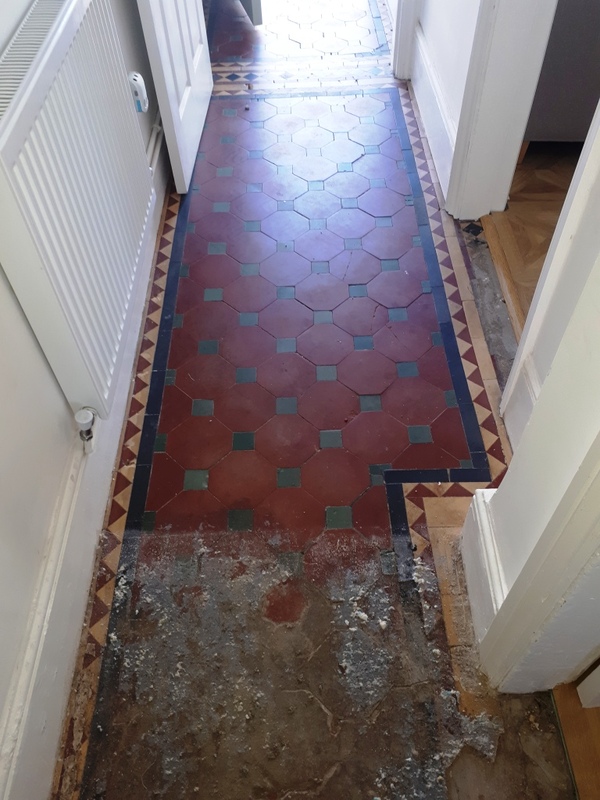 With the customers happy with the quote I returned to complete the work starting by covered the skirting and bottom of the stairs to protect the paintwork and carpet. 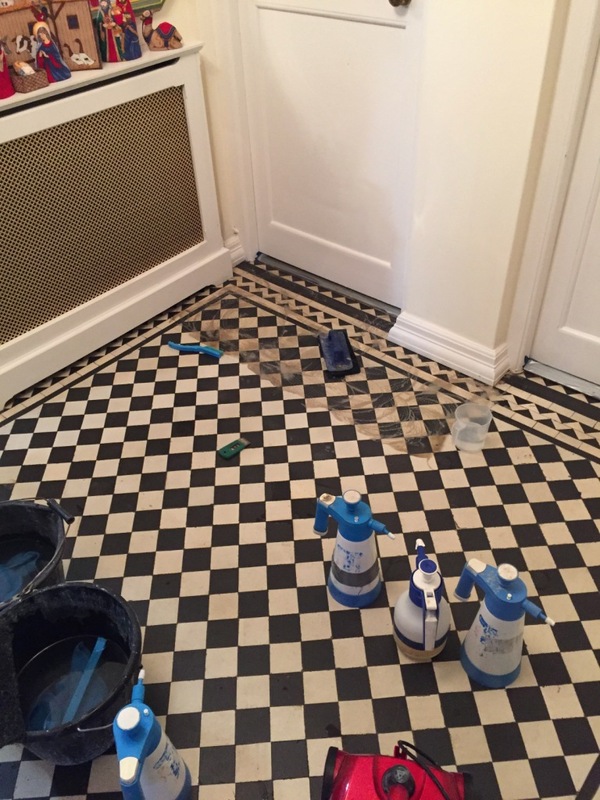 I then put a strong stripper/degreaser called Pro Clean on to the floor, ensuring even coverage and keeping and eye on the floor to make sure that it didn’t dry out. 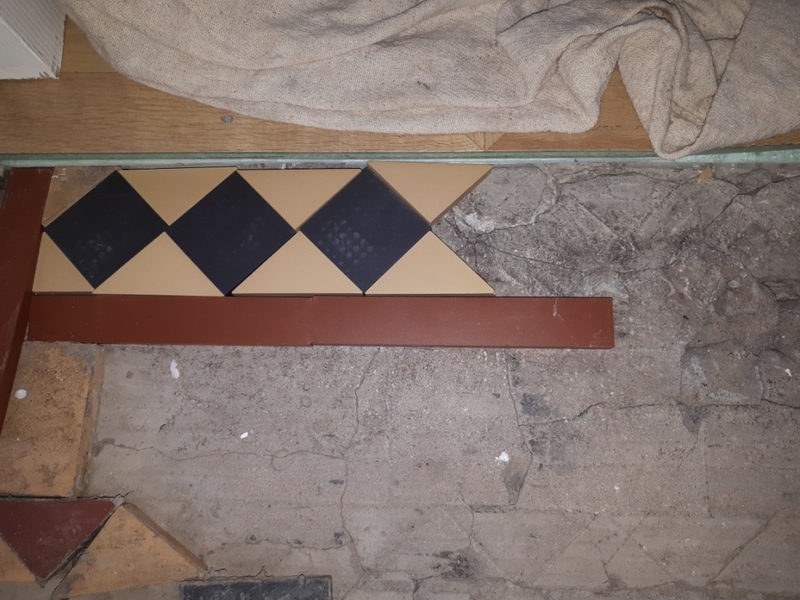 After a short dwell time I set to work scrubbing the floor with a 400 grit diamond burnishing pad and using small hand blocks to get into the corners and any edges not reached by my machine. 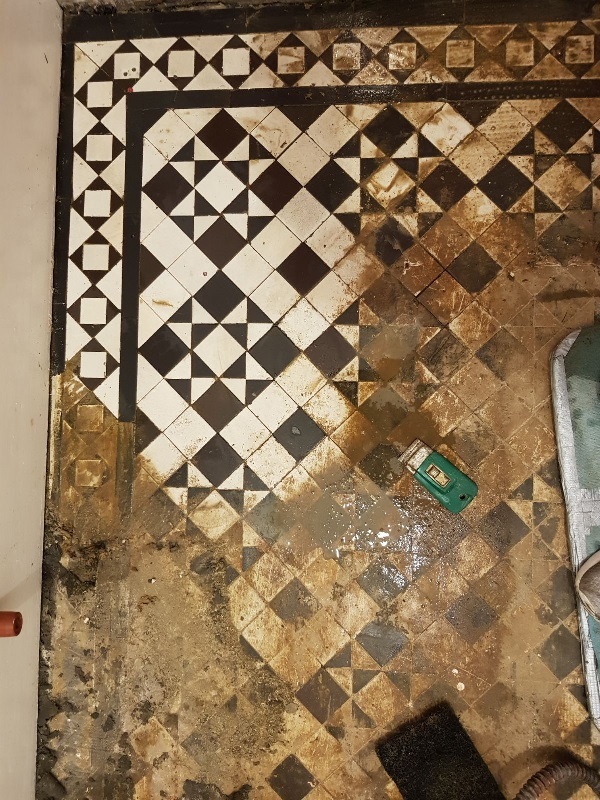 Once I was satisfied that the tiles were as good as they could be I rinsed the floor to remove the alkaline cleaner and soiled water. 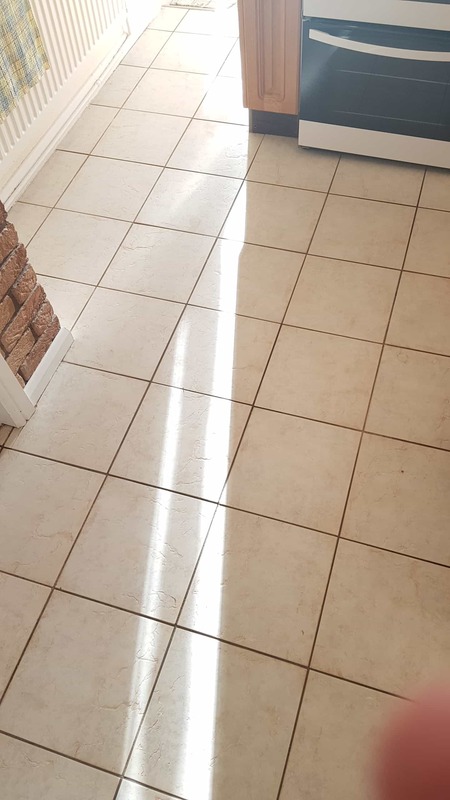 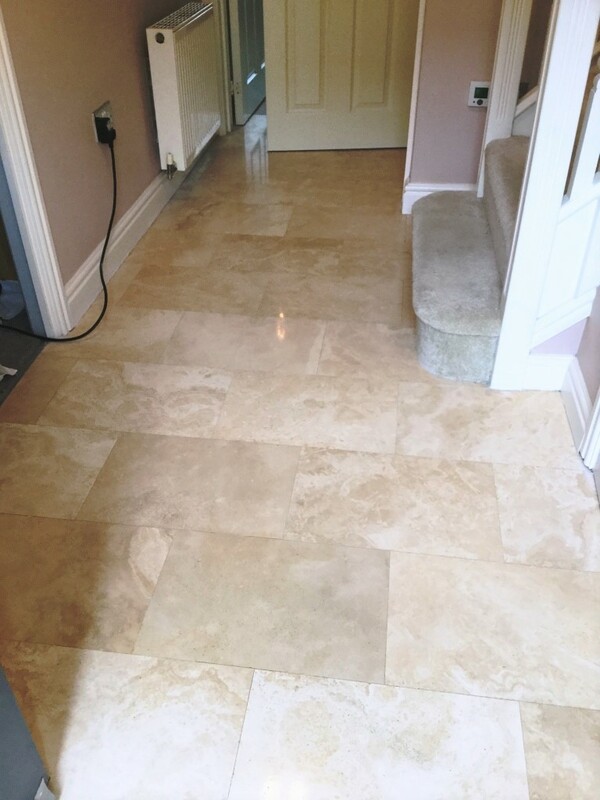 This was followed by giving the floor an Acid rinse using Tile Doctor’s Acid Gel, this process counteracts any alkaline salts that can rise up through the tile as it dries out, a process which is more commonly known as efflorescence. 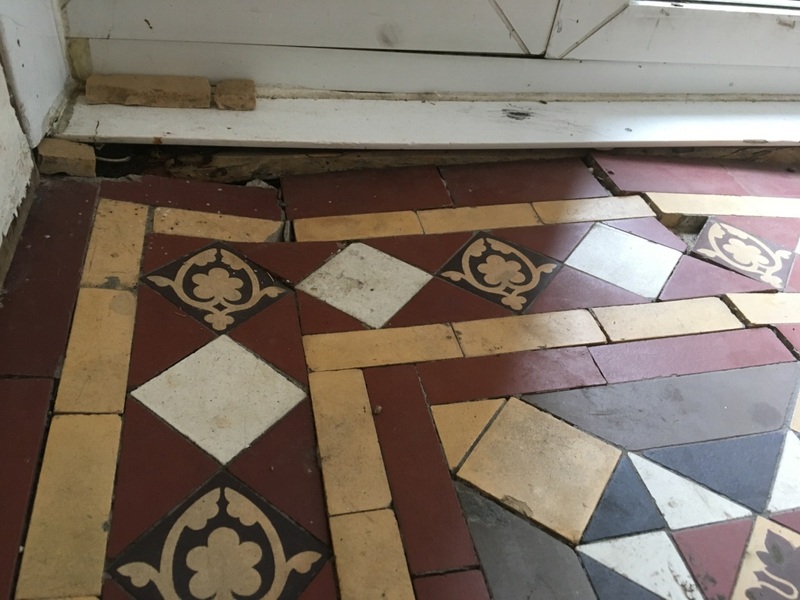 This can be quite a problem on floors like this that don’t have a damp proof course (floors generally didn’t pre-1950s). 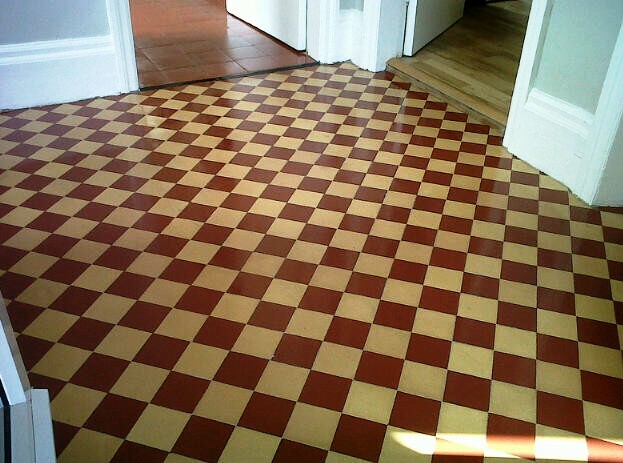 I had to be careful not to leave the acid down for too long because these tiles are susceptible to acid damage. 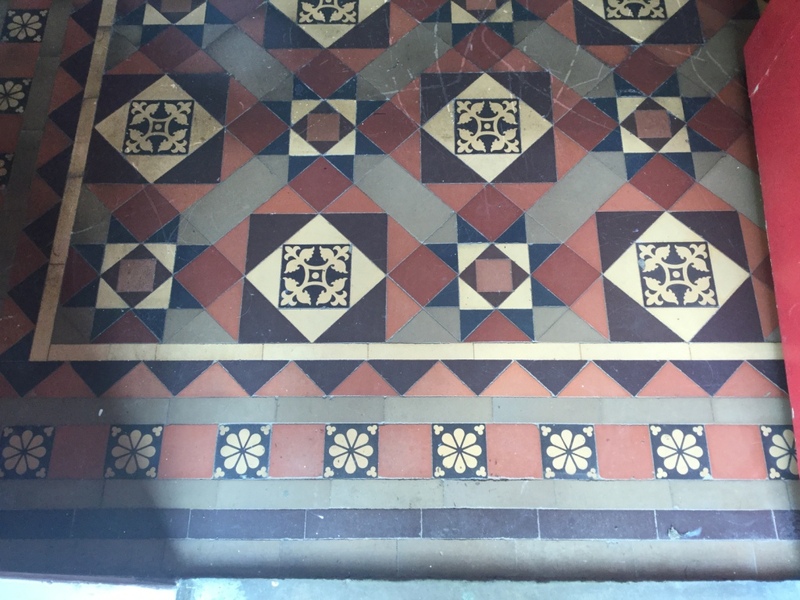 Dealing with salt issues on these old floors (efflorescence) is essential because they can damage the sealer or become trapped under it, detracting from the beauty of the floor. 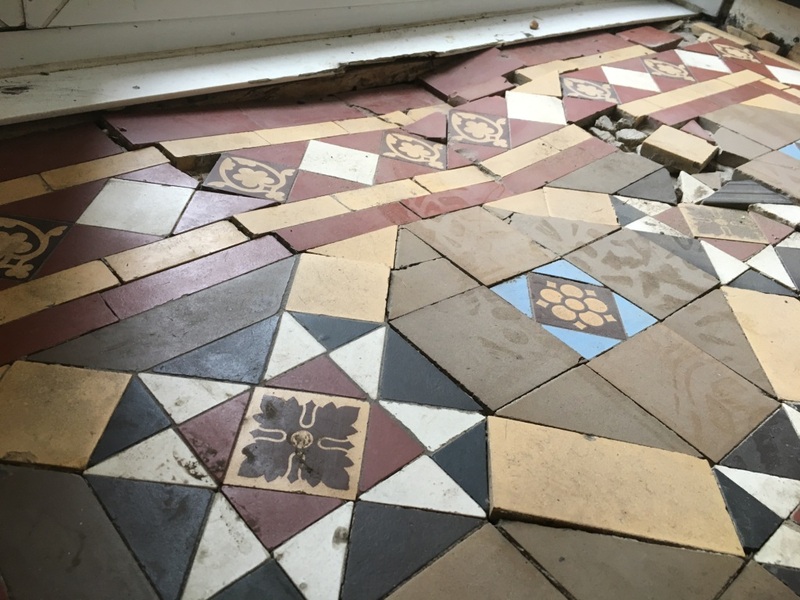 Given the age of the farmhouse it’s difficult to know what the floor had been laid onto. 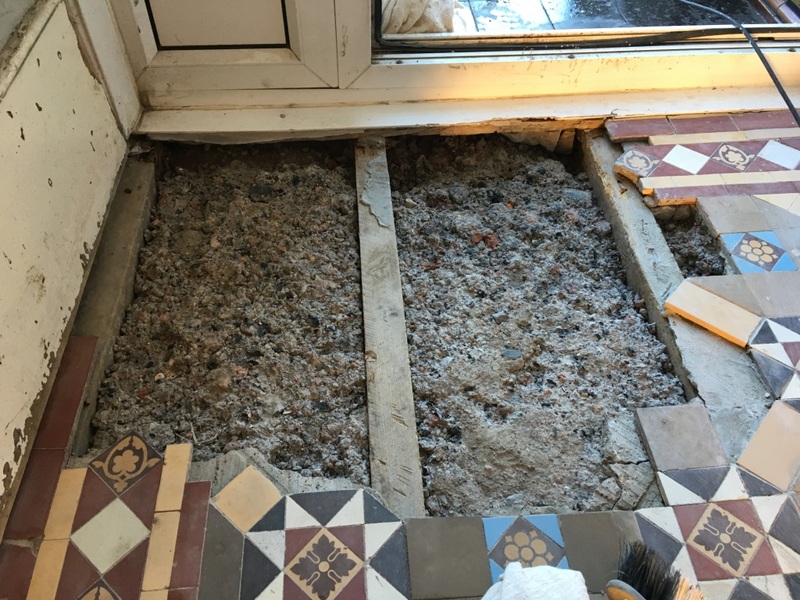 Often it was compacted rubble and building works from the erection of the adjoining buildings; additionally some of the later Victorian floors were laid on a wet limecrete scree which contain a high salt-content. 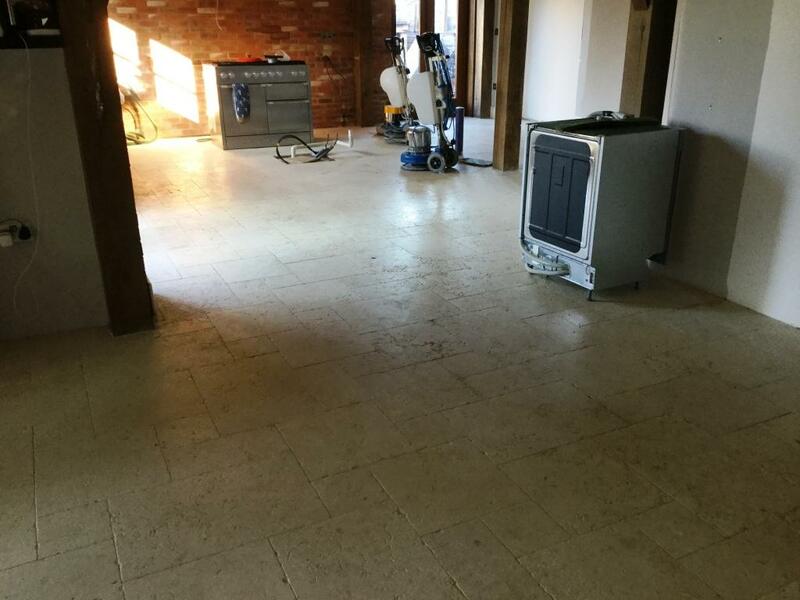 Before I left for the day I left an air mover on the floor to aid in the drying of the tiles. 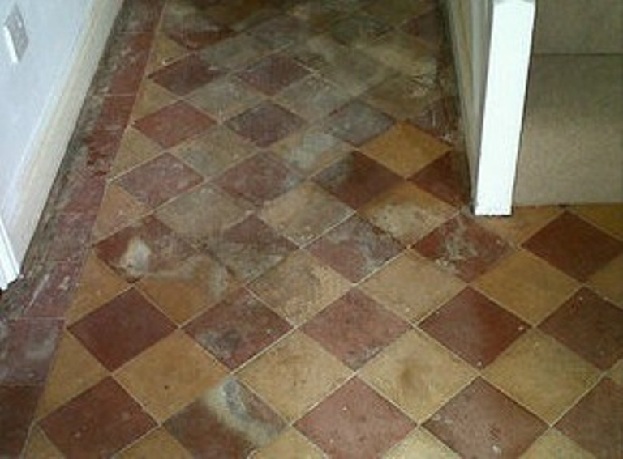 If there are radiators in the area I also suggest that they are turned on overnight to further aid the drying process. 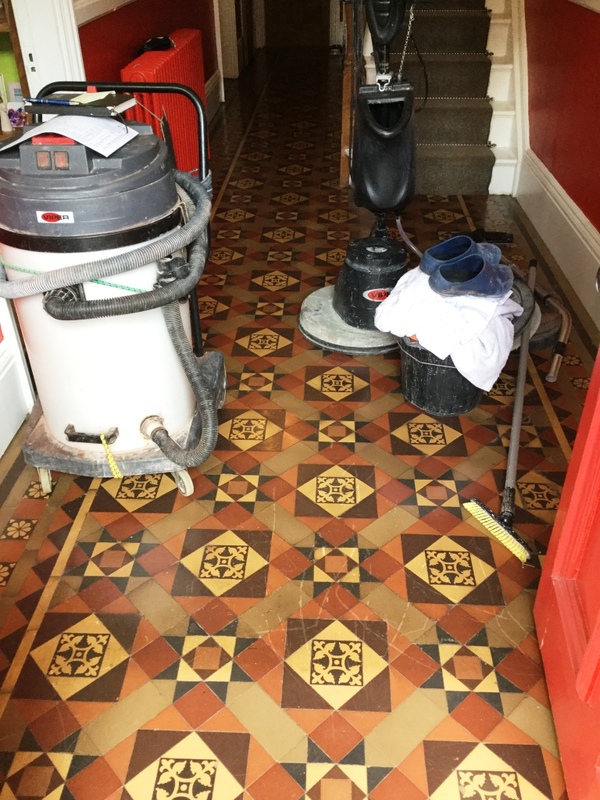 Occasionally these types of floors need to be left for several days to dry but it is worth the wait and the floors can be used in the meantime provided indoor shoes and socks only are used and care is taken not to get the floor dirty. 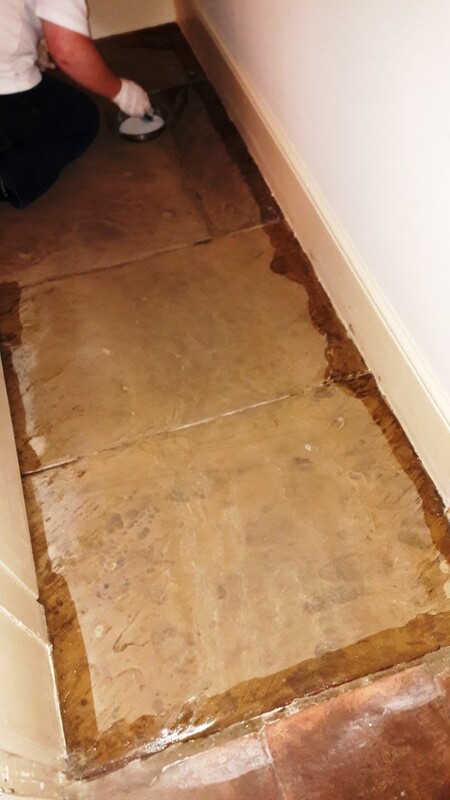 Upon returning the next day I tested the moisture content of the floor and was pleased to find that it was well within acceptable levels for the application of the sealer that I was planning to use. 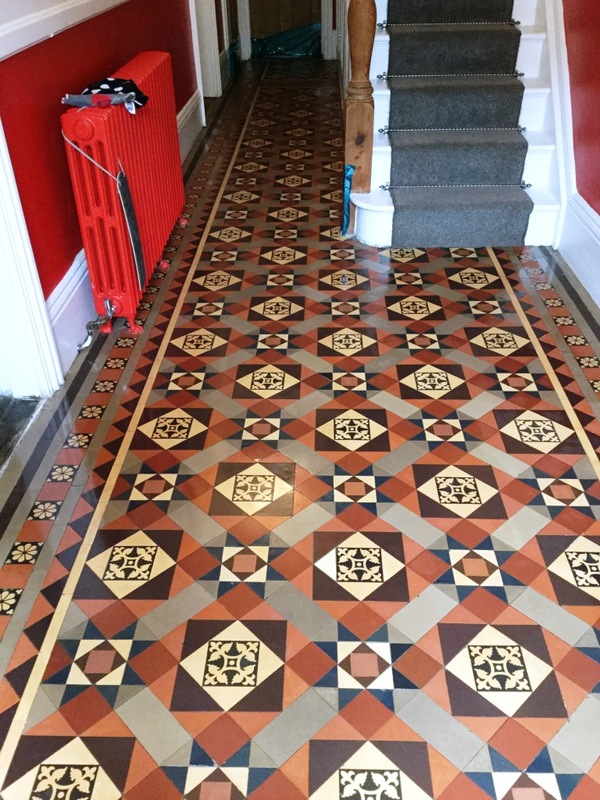 I quickly checked the floor for areas that I felt may be able to be improved and once satisfied a single coat of matt-finish, colour-enhancing sealer called Colour Grow was applied before two coats of a Seal and Go sealer was used to give the floor a satin finish, which I think gives it a slight glaze and freshly mopped appearance. 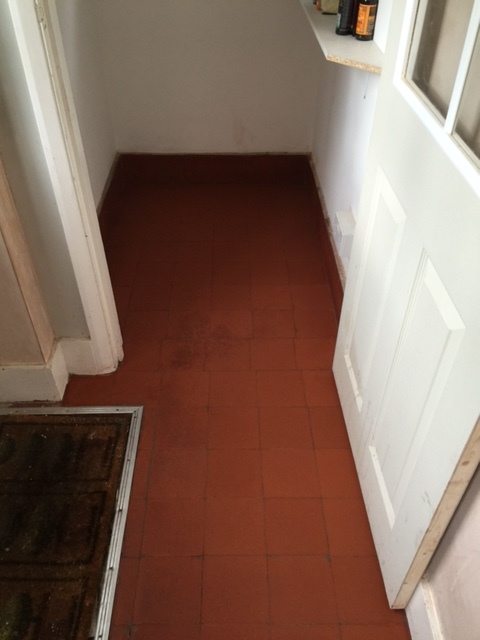 The customers were thrilled and said that they wished they had brought me in sooner! 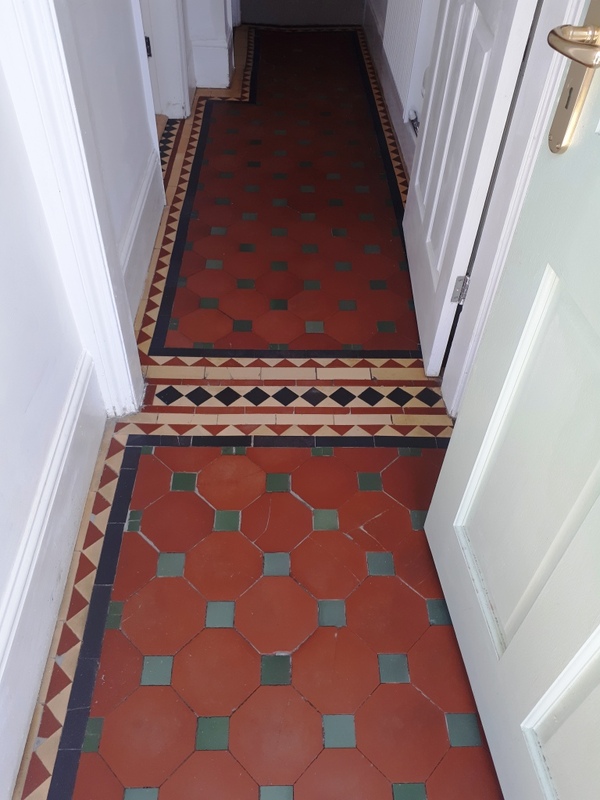 This customer who owned a lovely period residence in Leatherhead had pulled up an old hallway carpet to discover this gem of Victorian Tiled floor. 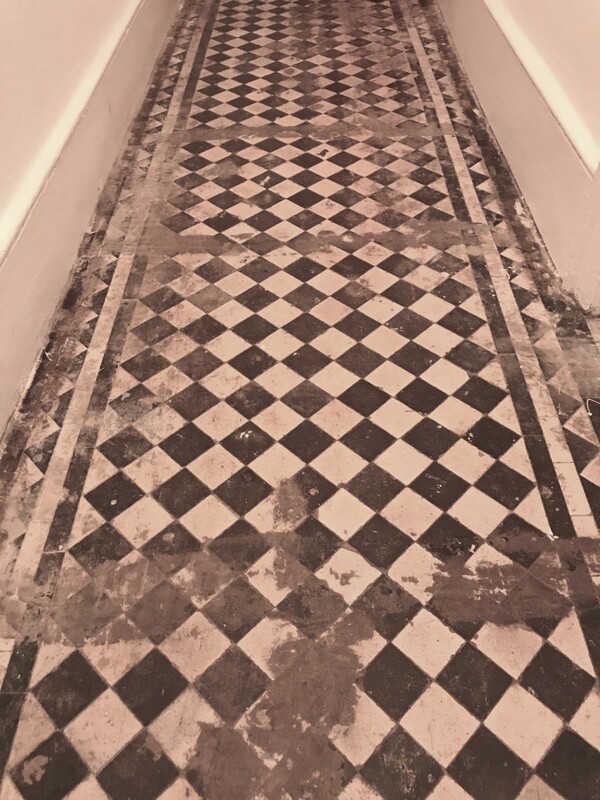 The tiles were covered in carpet adhesive, paint splashes and what looked like a hundred years of dirt. 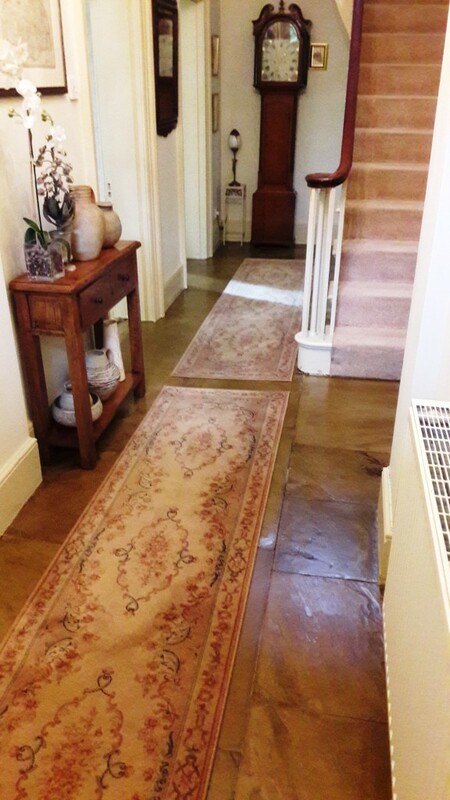 I suspect the previous owners felt it was easier to cover the hallway in carpet rather than have it cleaned properly or perhaps it was just the trend at the time. 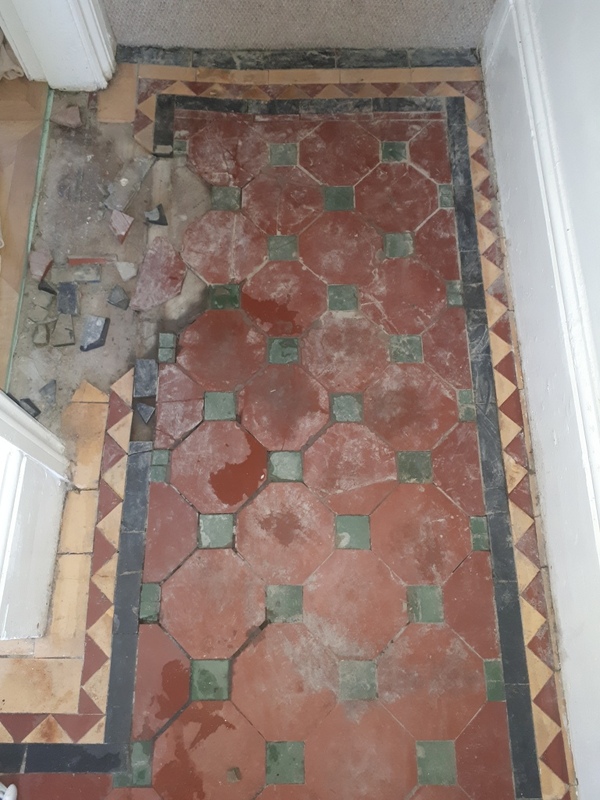 Given the obvious amount of work that would be needed to restore it we got a call to pop round and provide an estimate. 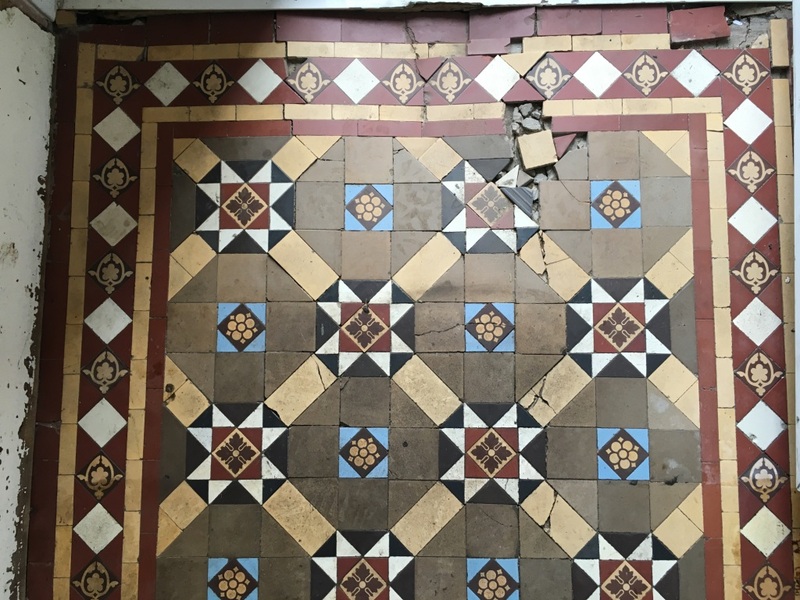 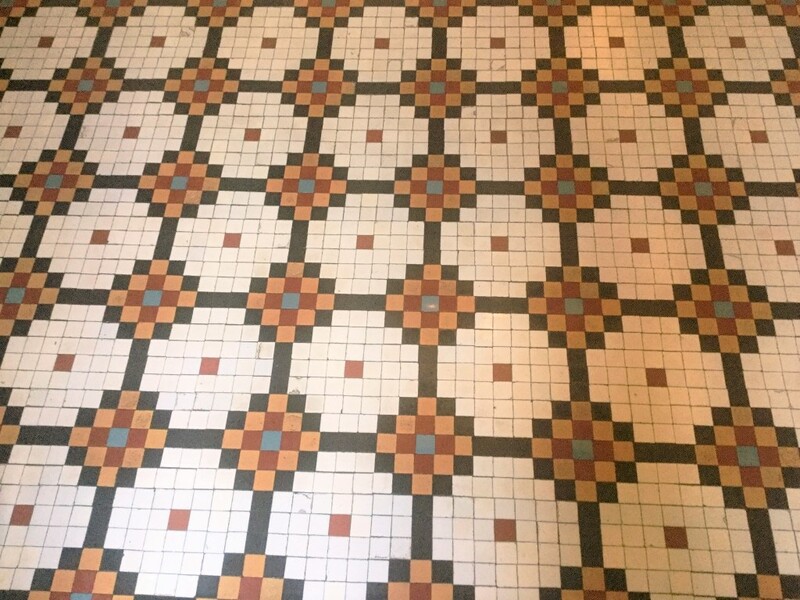 We do a lot of Victorian floor restorations and across the Tile Doctor network I’m confident in saying there is a Tile Doctor working on a Victorian Tiled floor every day of the week. 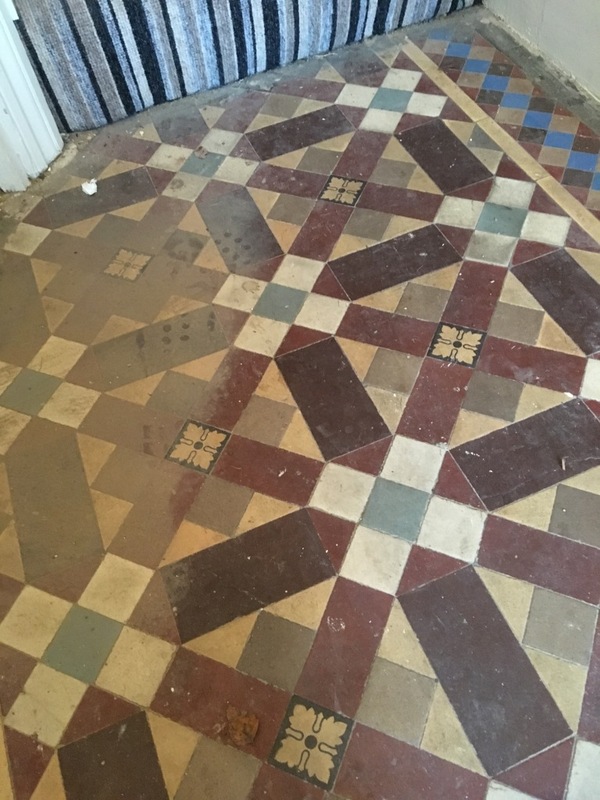 The owner was happy with the quote and we agreed a date to return and restore the floor. 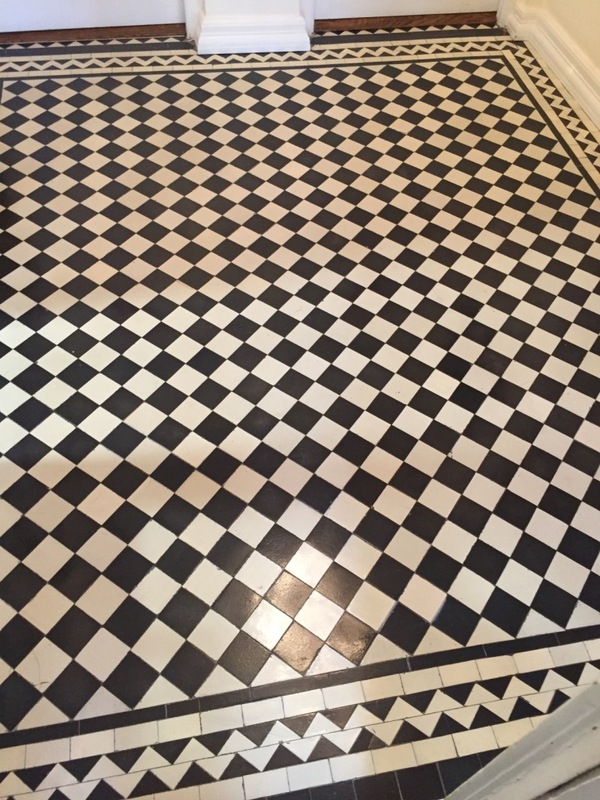 Working in a metre square area at a time, I first applied a solution of Tile Doctor Oxy-Gel and left it to dwell for twenty minutes. 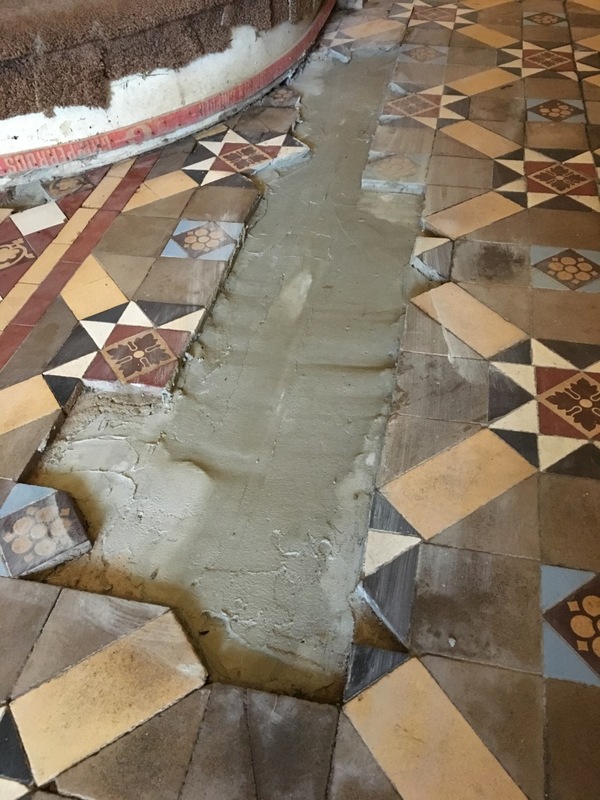 Oxy-Gel is a relatively new product that being in Gel form is easy to control and stays in place allowing it to dissolve dirt and in this case loosen the adhesive. 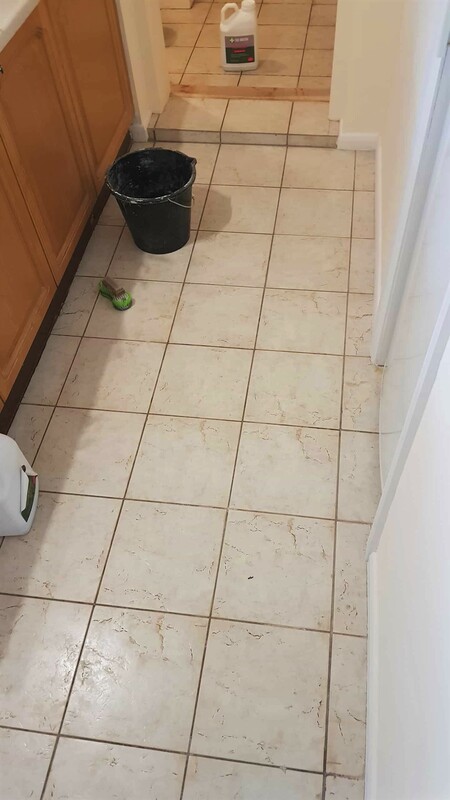 After leaving it to dwell for 20 minutes I attacked it with a very coarse 100 grit diamond pad attached to a buffer machine. 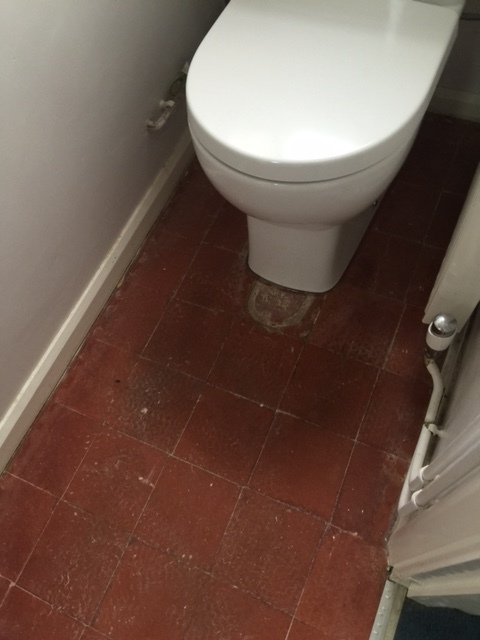 This removed a minuscule layer from the surface of the tile and with it the muck. 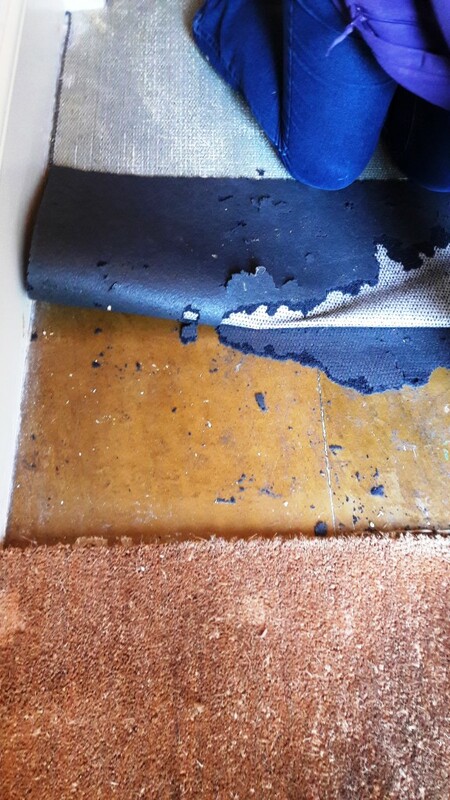 I vacuumed up the excess with a wet vacuum then rubbed down the stubborn areas with a 50 grit hand block. 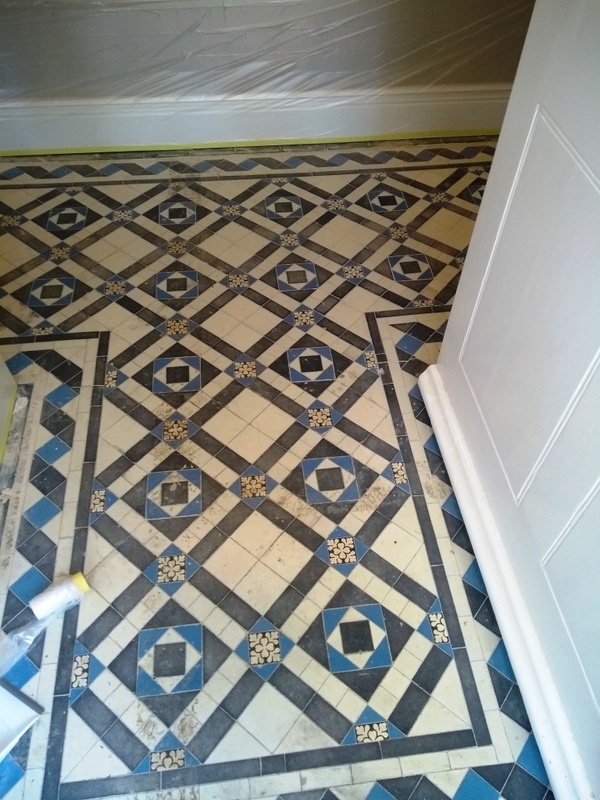 This removed a lot of dirt and drastically lightened the whites and blues. 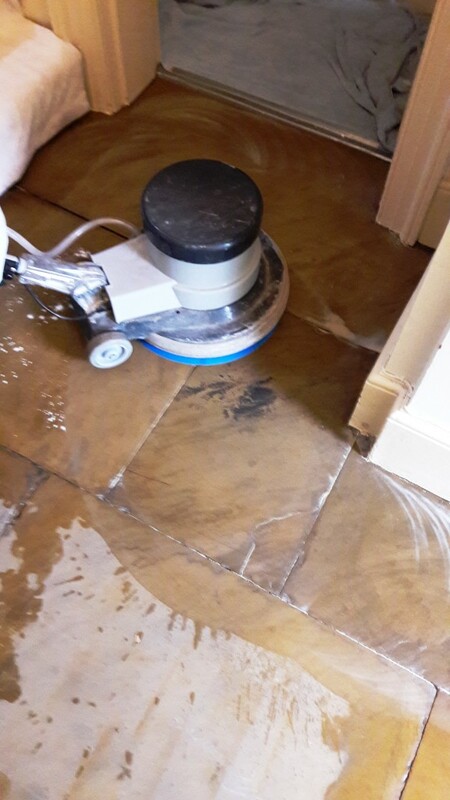 Finally I neutralised the floor with two rinses of clean, warm water again using the wet vacuum to remove as much moisture as possible from the floor. 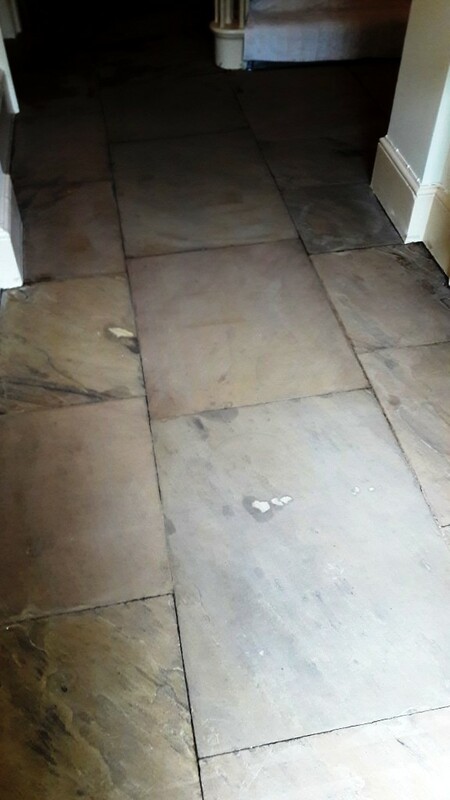 I repeated this process along the length of the hallway and then inspected the floor retreating any areas containing stubborn marks. 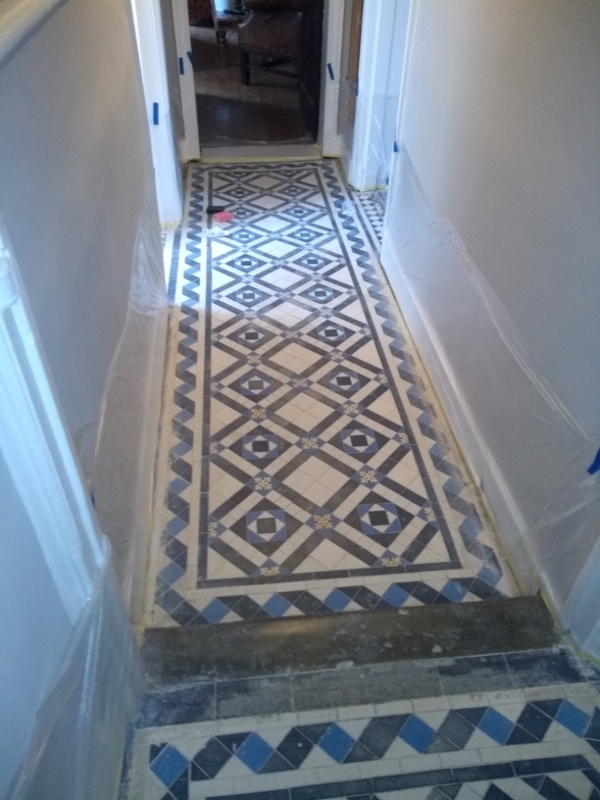 The hallway wasn’t that big an area so I had agreed to do the whole floor in one day. 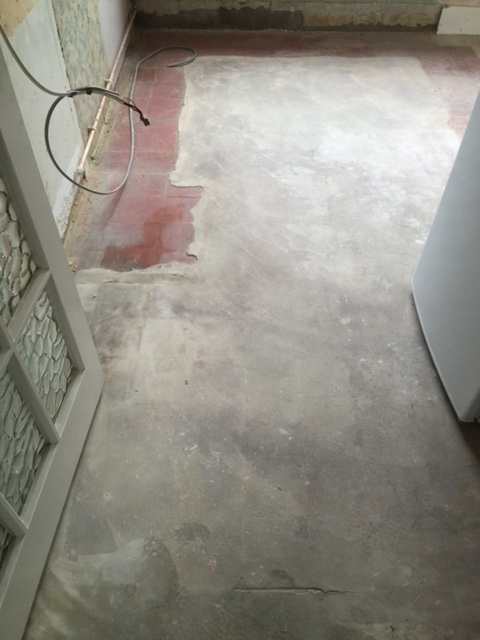 As a result I needed to force dry the floor so I could seal the tiles in the same day. 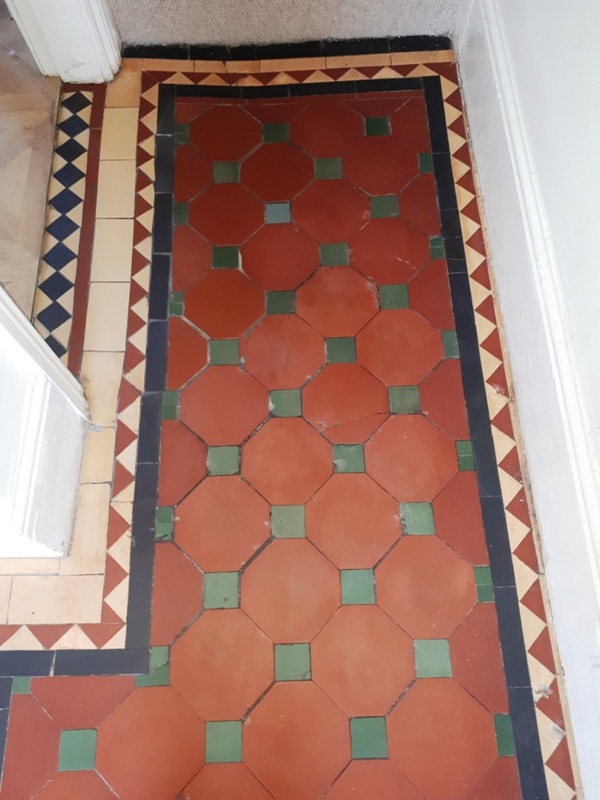 I have a number of tools to do this including an industrial air mover and a heat gun which were applied for about an hour before it was dry. 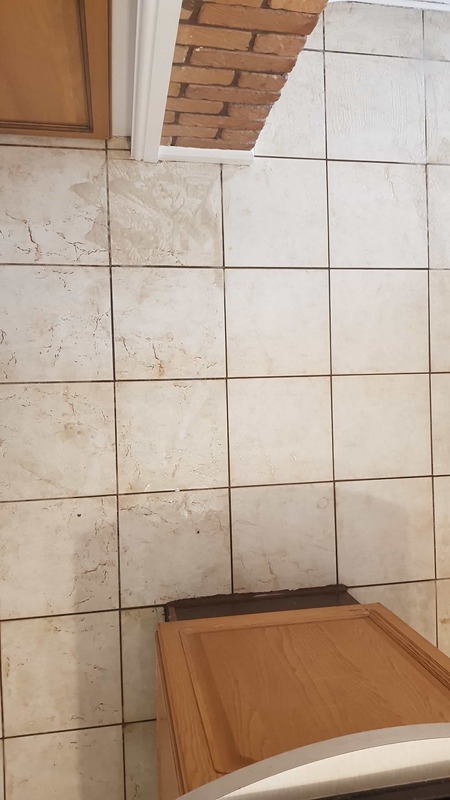 To seal the tiles I applied two coats of Tile Doctor Colour Grow which as its name suggests is a colour enhancing sealer that works by impregnating the pores of the tile protecting it from within and enriching the colours in the process. 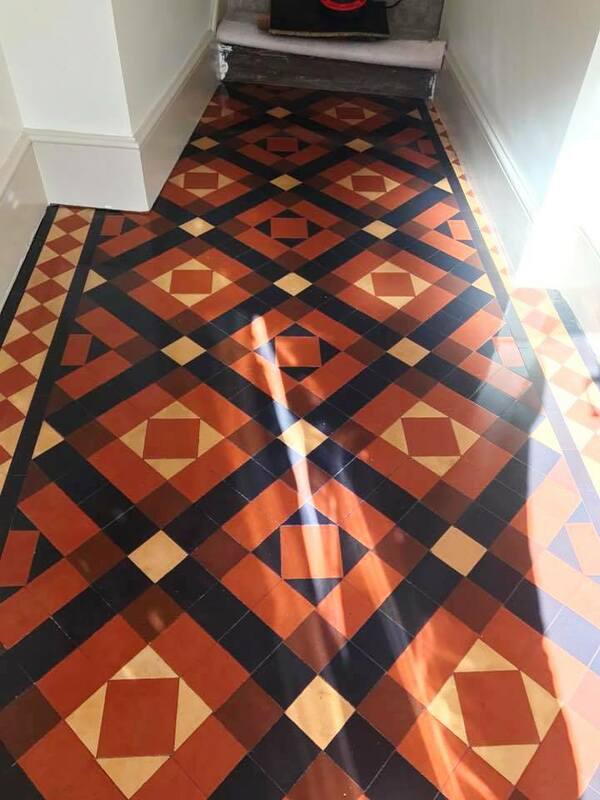 This gave a lovely contrast in colour whilst providing a matt finish; another advantage of Colour Grow is it’s a fully breathable sealer which won’t trap moisture under the tile which is important for these old floors where no damp proof membrane is installed. 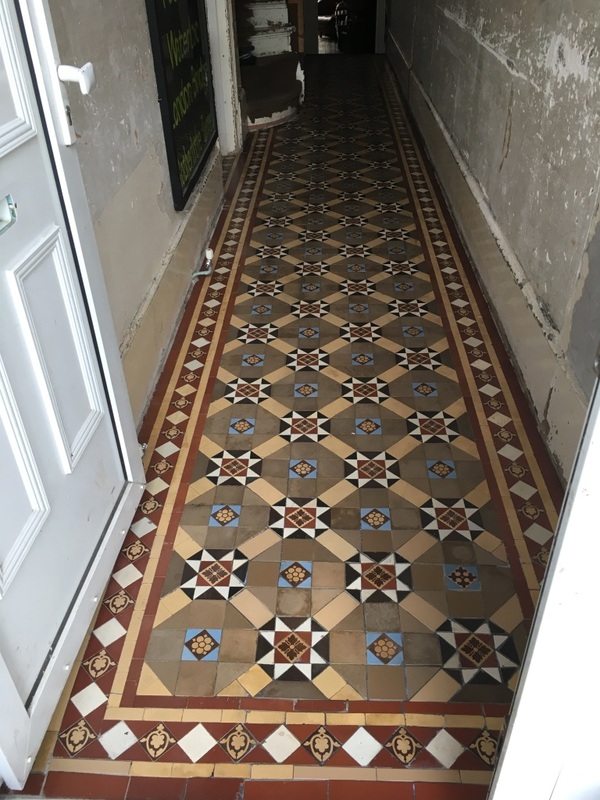 The Victorian tiled hallway floor now looks amazing.